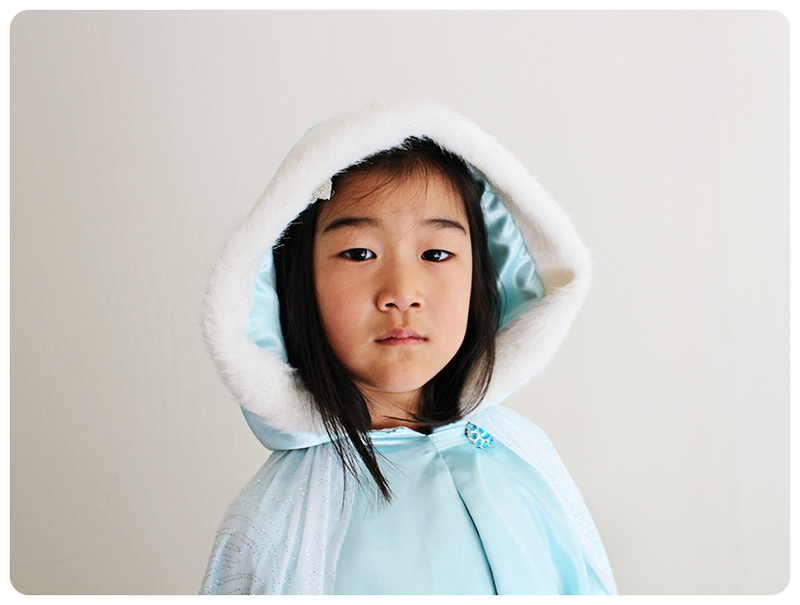 My friend asked if I could make her daughter an Elsa cape from the Disney movie, Frozen. Apparently, Elsa costumes are sold out everywhere. 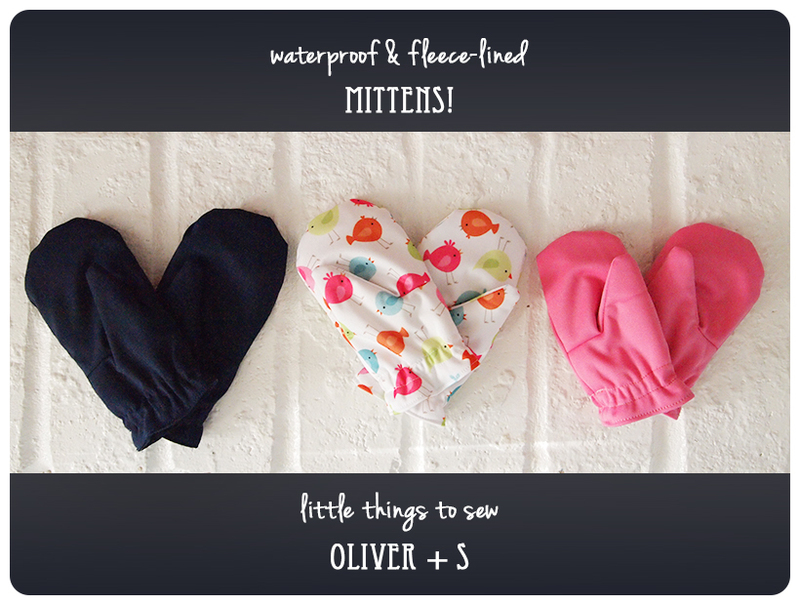 I thought the oliver+s “little things to sew” red riding hood cape pattern would be perfect, so I agreed. Besides, I’m participating in Lightning McStitch’s cover to cover challenge and I’ve been wanting to make another lovely project from the book. Froo wanted one too, of course. 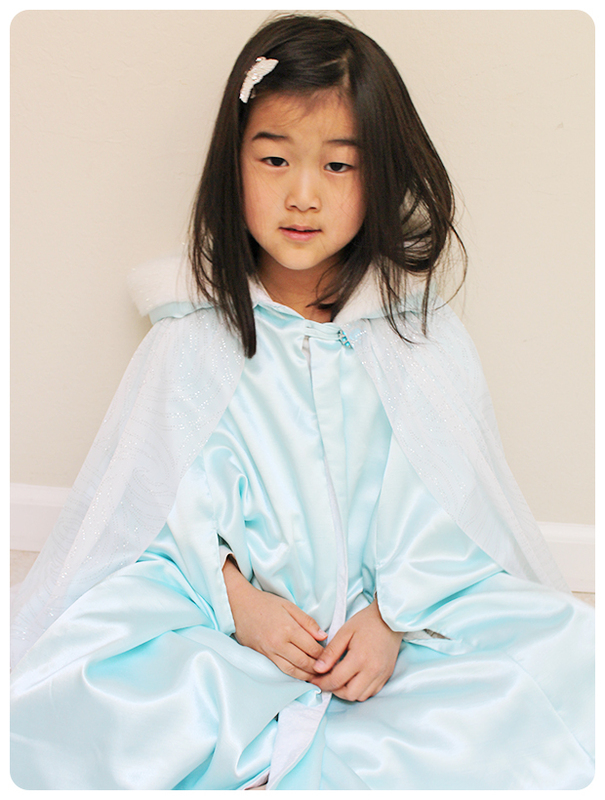 I asked if she would prefer an Anna cape–being the nicer, warmer, happier, and care-free younger sister (ahem), but she was insistent. 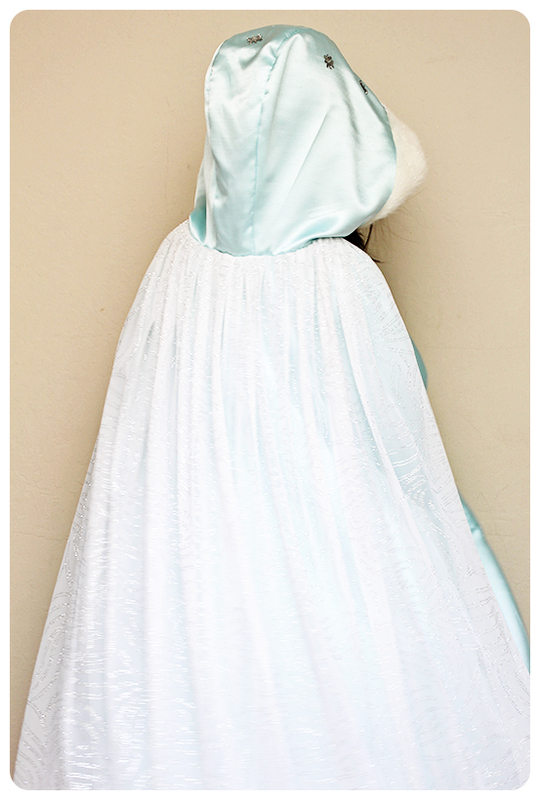 We also went to a Frozen-themed birthday party for Froo’s BFF, so I thought I would make her one as well. Yup, that’s right, a total of 3 capes! I don’t even like princess dress-up clothes! Seriously. 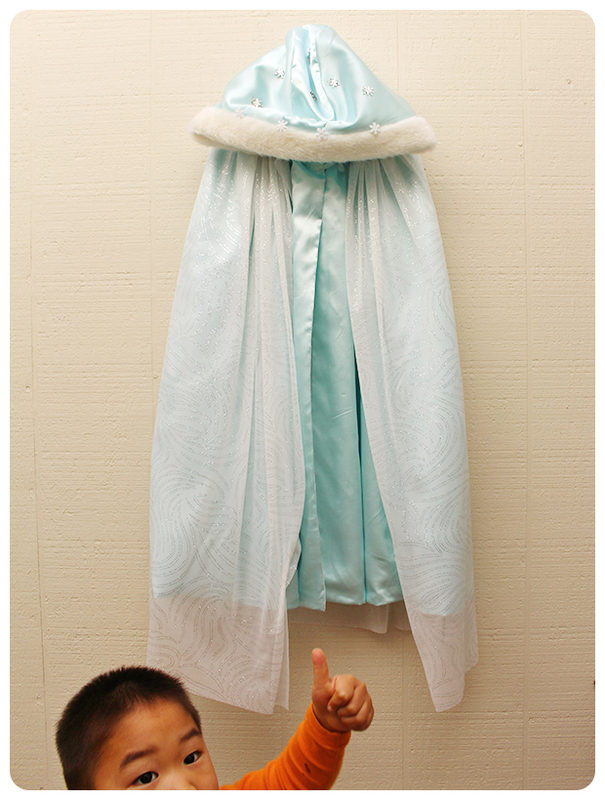 But I loved the movie and I love winter capes even more–so I was determined to make my own version of the Elsa cape and make it right. I made one small cape and 2 large capes. 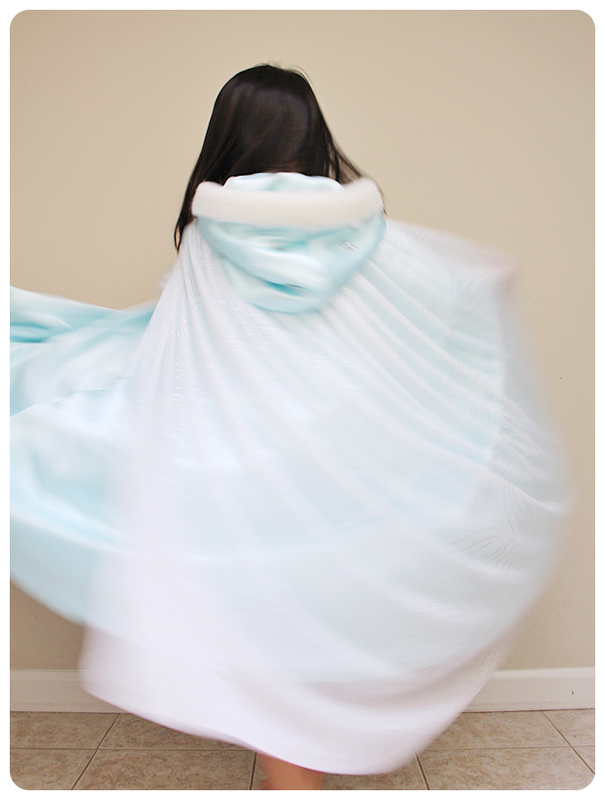 I lengthened each cape by 10 inches to give it a dramatic princess look. We had to outfit Boo and his bunny to get some photos of all 3 capes. I purchased all of the fabric from Jo-Ann. I scored the polyester shantung in the redtag clearance section for $3/yrd, after an additional 50% discount. 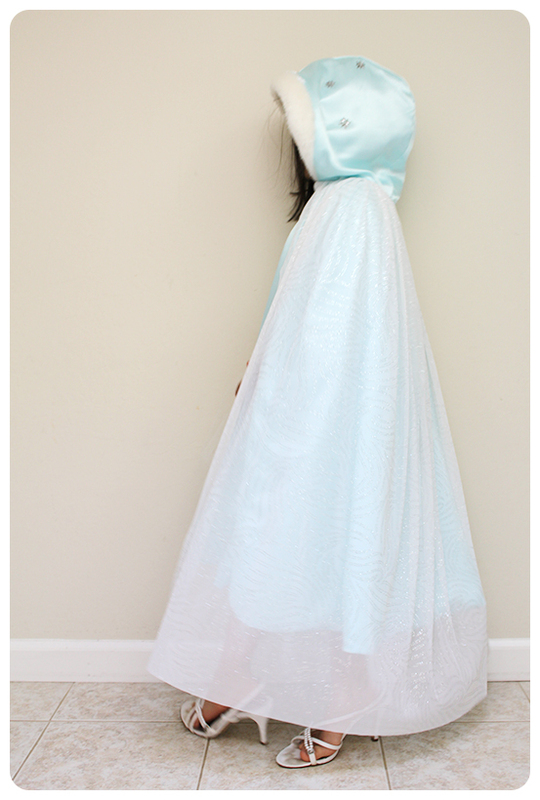 It is the PERFECT colour with an amazing flowy drape. Cutting & sewing it, however, was a nightmare. It’s shifty and slippery. I’m pretty sure I started with some skewed pieces (the fabric had to be completely flat before cutting), but the shantung didn’t always match up after sewing it together, whereas, the lining did. 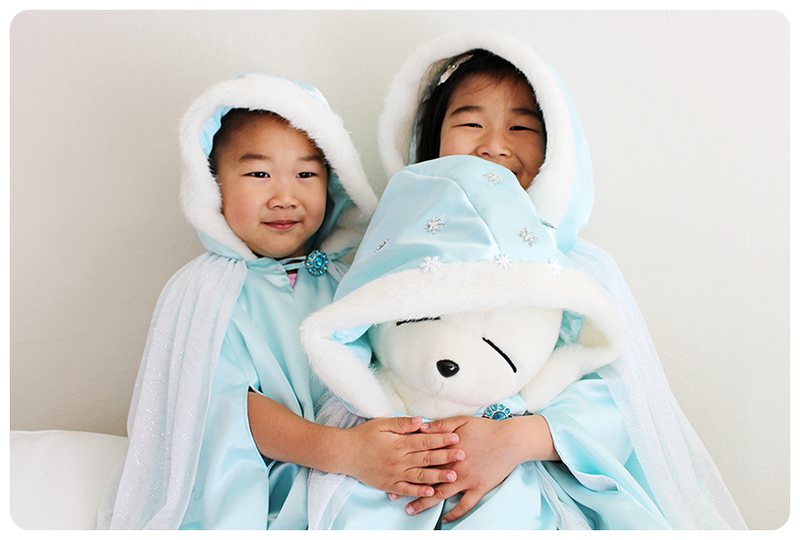 The great thing about making a winter cape in March–the lining fabric was also on clearance. The drawback: there wasn’t quite enough. 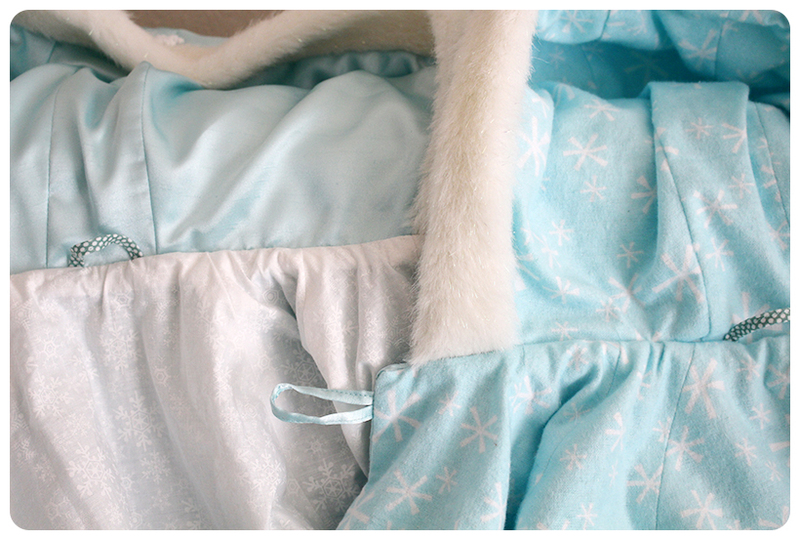 I used a super cute aqua flannel with white snowflakes for 2 capes and a subtle tone-on-tone white snowflake quilting cotton for Froo’s. There wasn’t enough of that one either, so the hood is self-lined. The overlay is really quite spectacular. I found a sheer, stretchy fabric with glittery silver sparkle swirls that looks amazing, with even the slightest movement. However, the shimmer comes at an annoying cost: it sheds pixie dust everywhere. The good news–no finishing required! I was going to trim the edges with sequins, but I thought it would weigh down the fabric and seriously, I’m not that crazy. Maybe just a little. My favourite part of this cape is the fur lined hood! 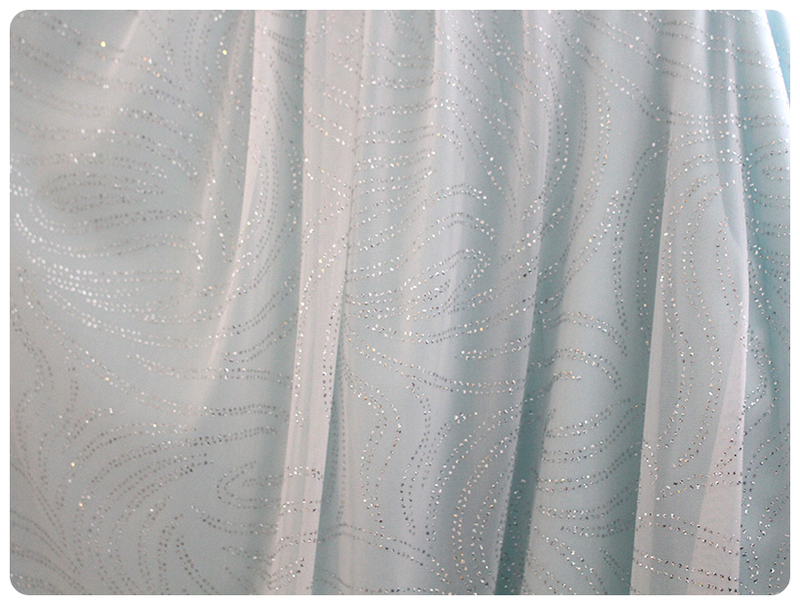 There are iridescent tinsel “hairs” dispersed within the fake fur, giving it a subtle sparkle. Love it. 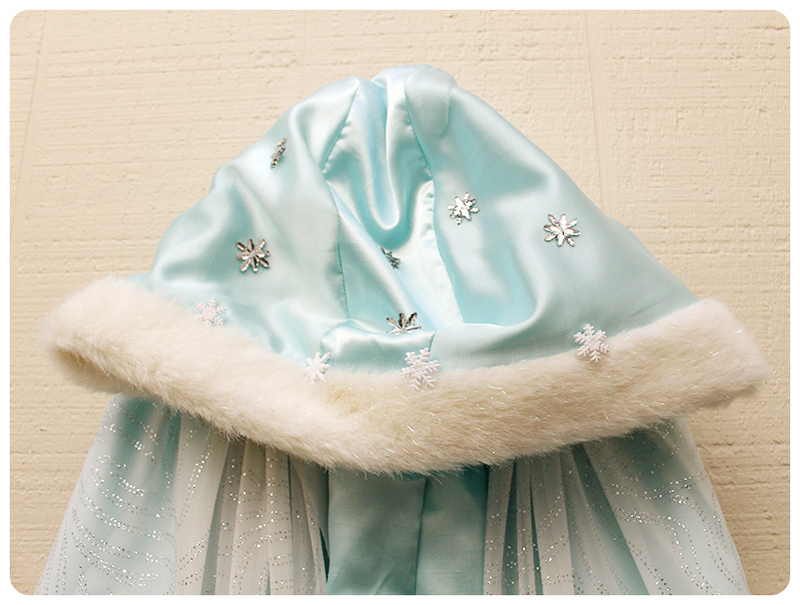 The hood is embellished with snowflake crystals and buttons stitched at random. 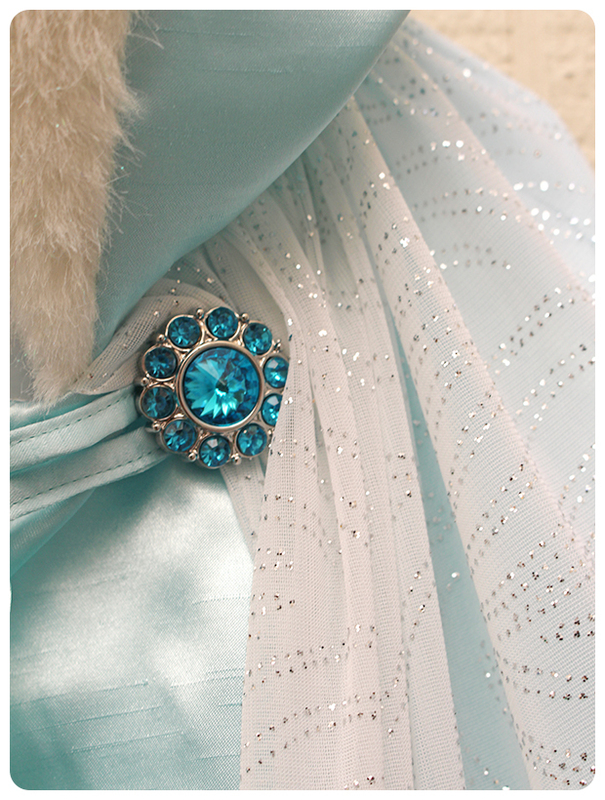 I used a big rhinestone aqua button as a closure. I like the bright pop of colour it adds to the cape. 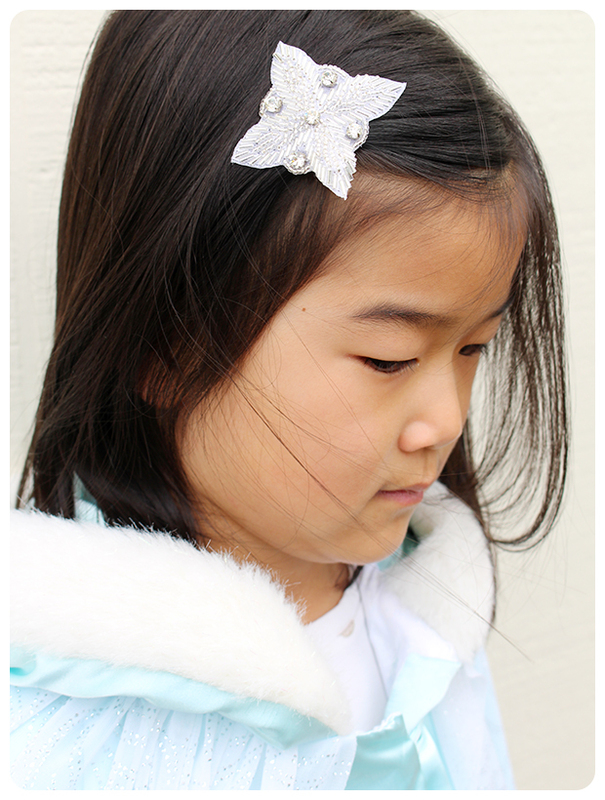 Finally, I bought a couple of bead and rhinestone appliques from Britex Fabrics to make hair clips. There were so many beautiful ones to choose from, but finally, I chose one that resembles a snowflake. I used E6000 glue to attach an alligator clip to the applique. So my thoughts? The red riding hood cape pattern is amazing. It really is. The shape is circular, while accounting for the curves at the shoulders, with clever arm openings–the design is brilliant! The hubs even said, “that is the best thing you’ve ever made.” I was completely surprised. I mean, I’ve made oodles of things, to which the hubs either says, “that’s nice” or on rare occasions, “that’s very nice”, but this one definitely has that wow factor. An hour later, he scowled at me after vacuuming up all the pixie dust. Hee hee. I should have made the overlay detachable, maybe? 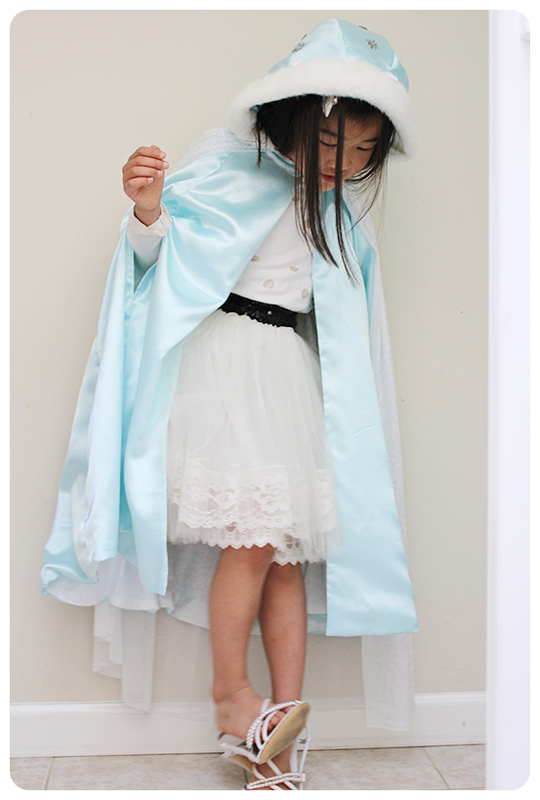 I took some photos of Froo wearing the Elsa cape with her winter wonderland tutu and my wedding shoes. 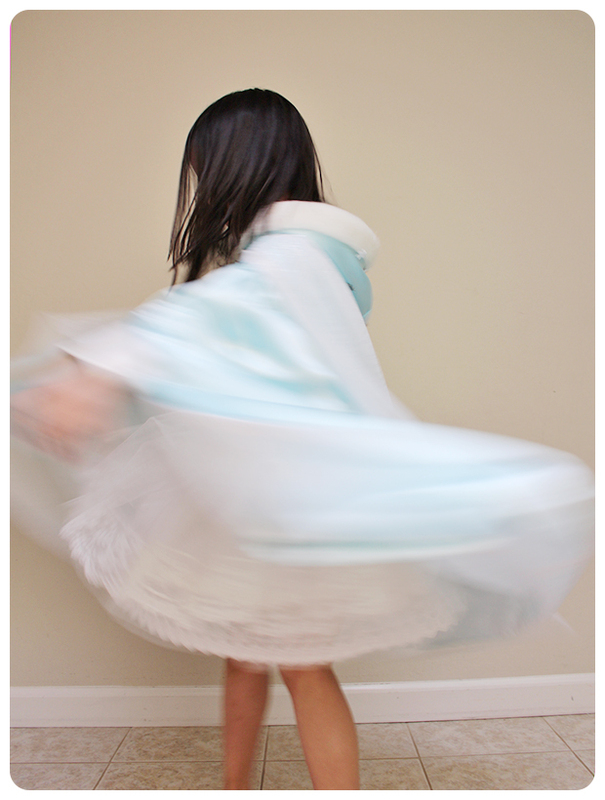 The girl would not stop twirling. The best man at our wedding welcomed his first child, a baby girl into his family on February 10! I am incredibly happy for the new parents and I can’t wait to meet their precious daughter, the next time we are back in Vancouver to visit. 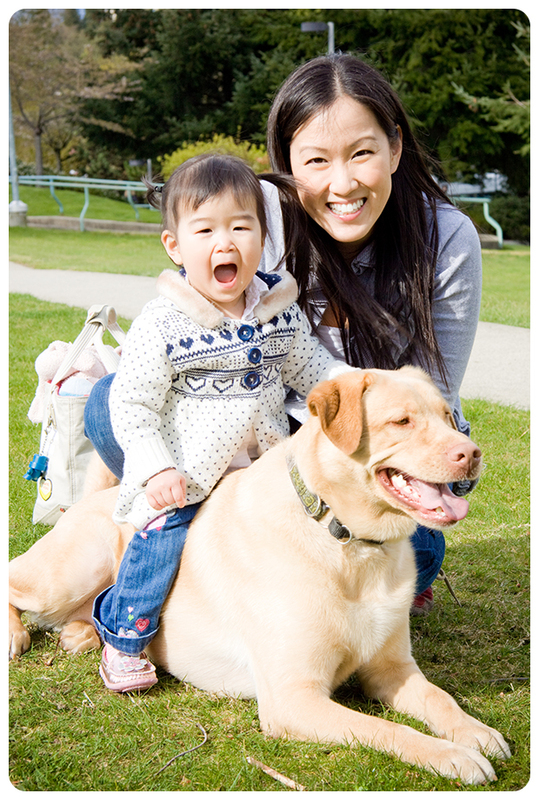 This couple holds a very special place in my heart because they adopted our first baby… a yellow labrador retriever named George. It was a difficult decision to find George a new home, but it was the right one and we are thrilled that he was adopted by friends. 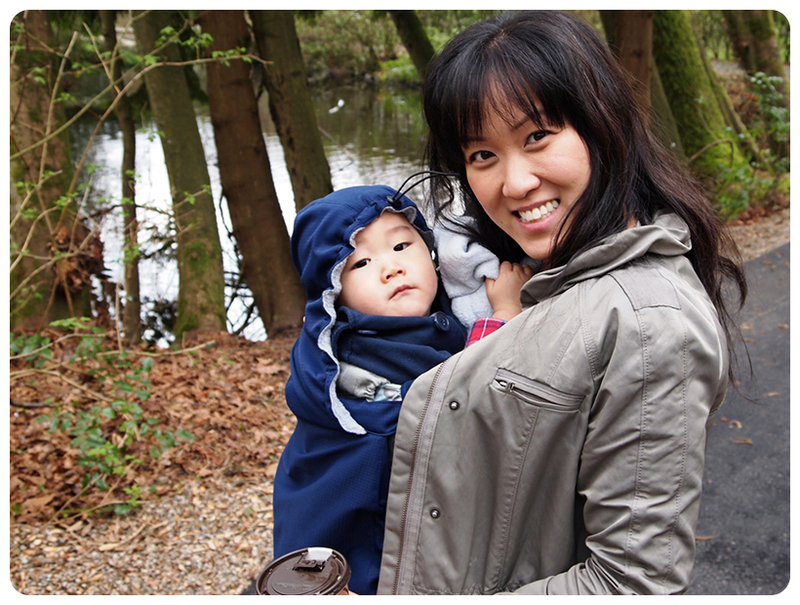 Friends who love the outdoors and take George out on nature-filled adventures. 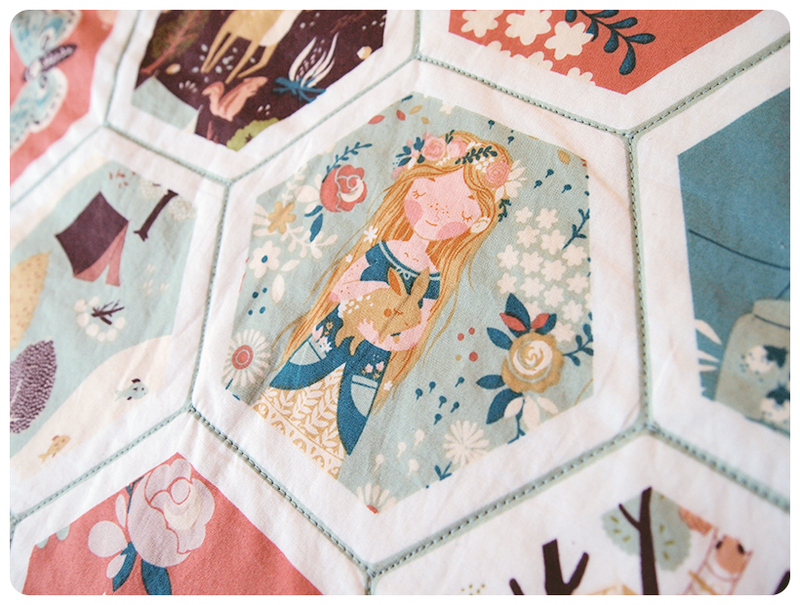 When I first spotted the Fort Firefly fabric collection by Teagan White, I knew it would be perfect for the new baby. I think her parents would appreciate that it’s not too girlie and the colours are varying shades of earth tones, with a vintage feel. 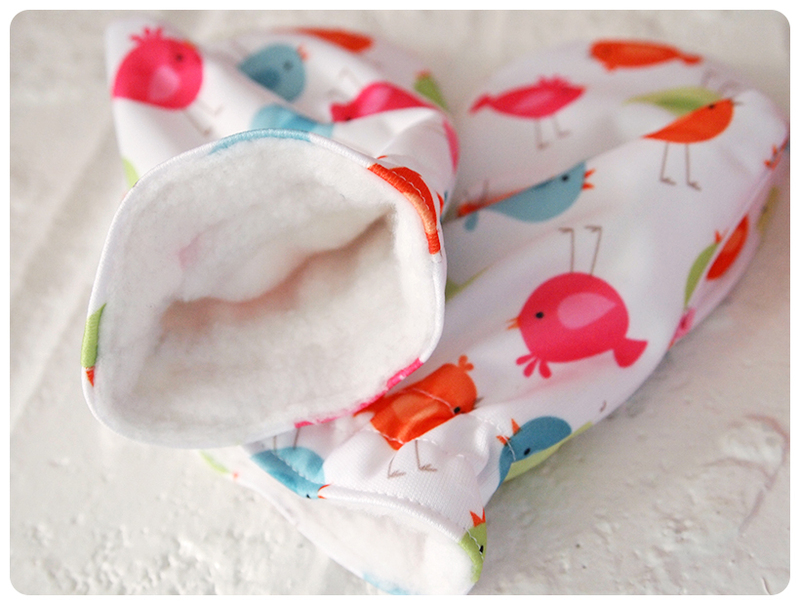 The fabric is also 100% organic cotton, which is perfect for newborn babies. 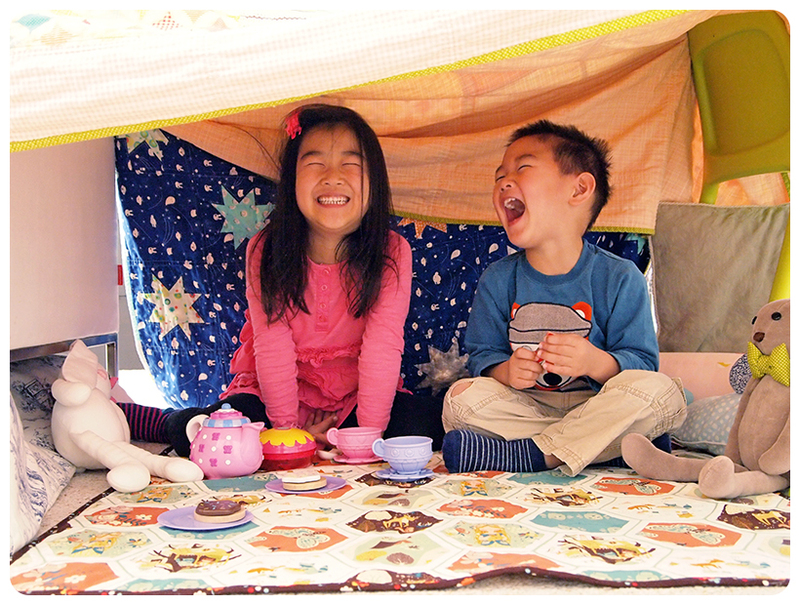 Besides, there are woodland creatures, fireflies and tents! 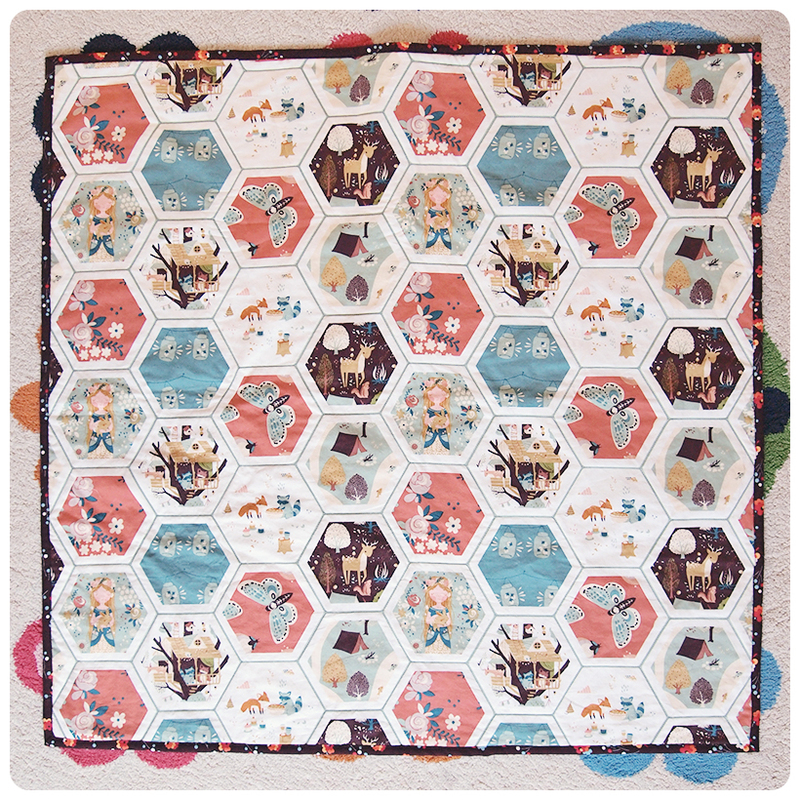 I chose the Firefly Hexi Patch print as the top of the quilt. I love that the hexi print already takes on the look of a patchwork quilt, so all I had to do was quilt on the existing lines with matching thread. 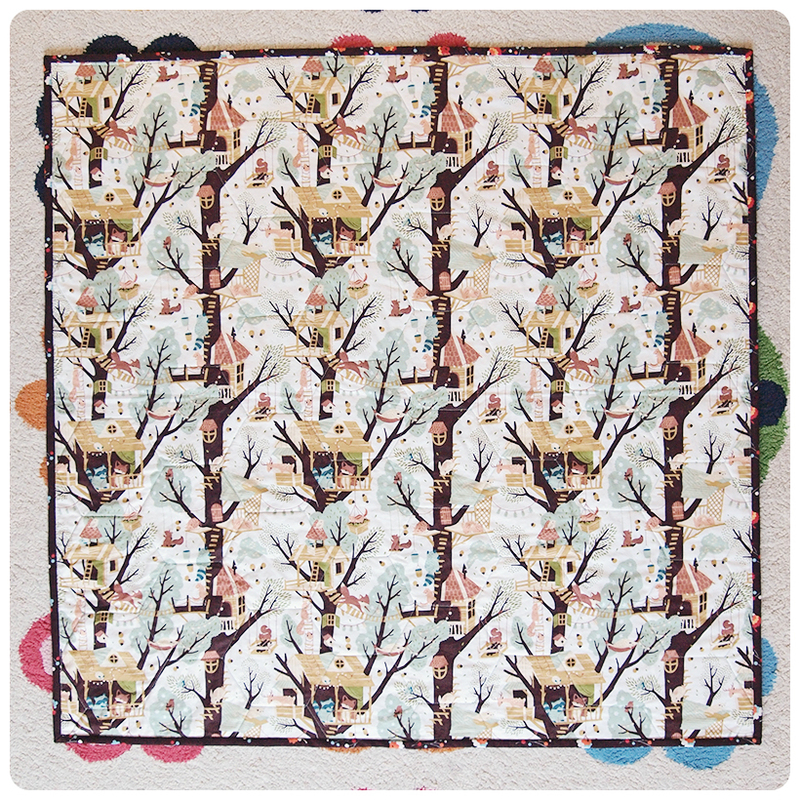 The Tree Fort print was used for the backing of the quilt. 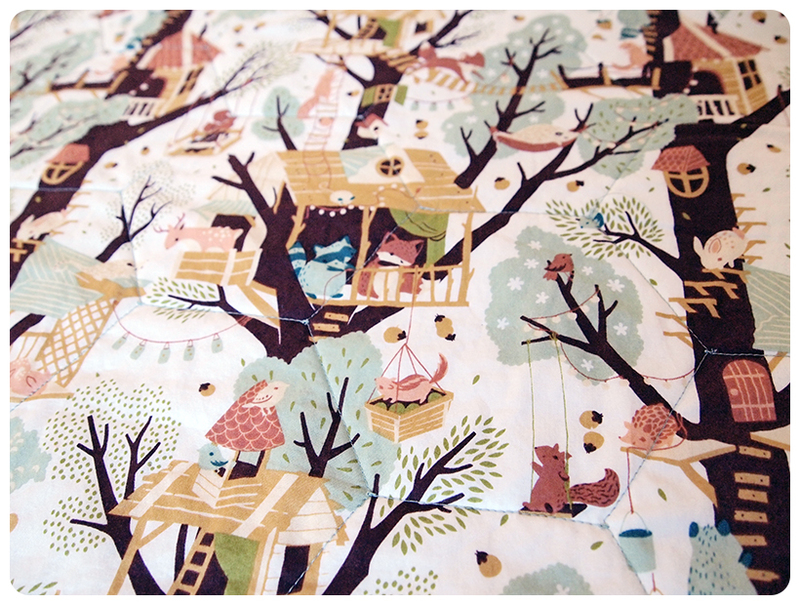 The print is busy, with animal friends having all sorts of fun in the tree forts. As the baby grows up, I think this print will provide her with oodles of visual stimulation. I used Warm & Natural cotton batting in between the two layers of fabric. 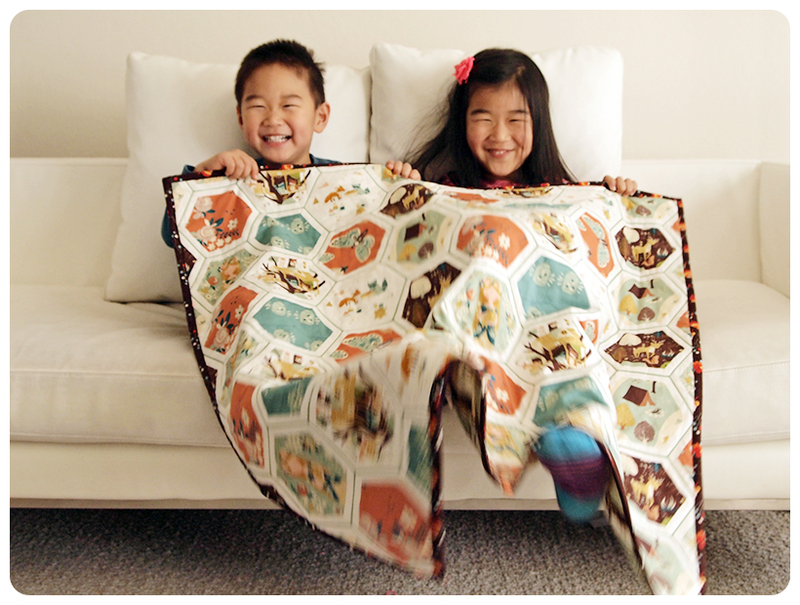 The quilt measures 35″ x 35″. I chose this size because I only had to purchase one yard of each print. There was a tiny amount of shrinkage in the wash and after squaring up the fabric, those were the final dimensions. The binding is from Denise Schmidt’s Flea Market Fancy fabric collection, that I’ve had for quite some time. 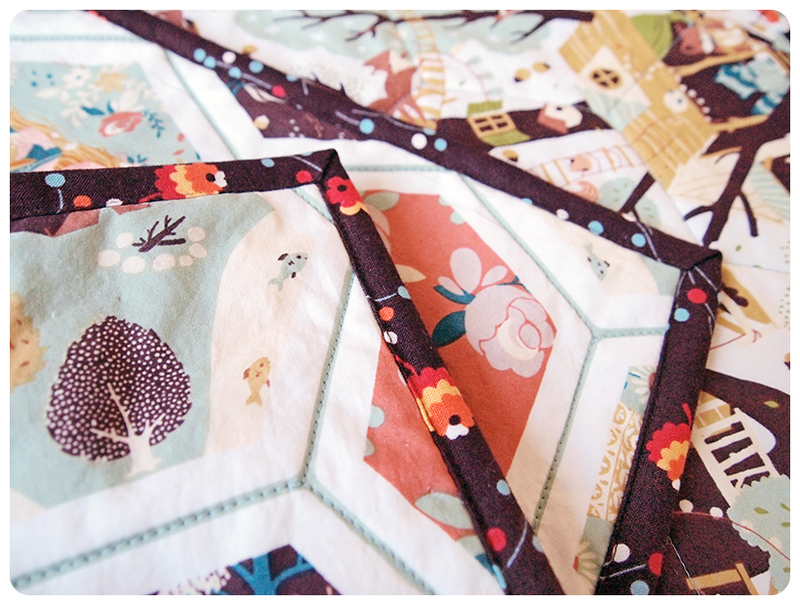 The brown coordinates with the quilt and the posies add a pop of colour to the binding. I machine stitched the binding onto the quilt for a quick finish. 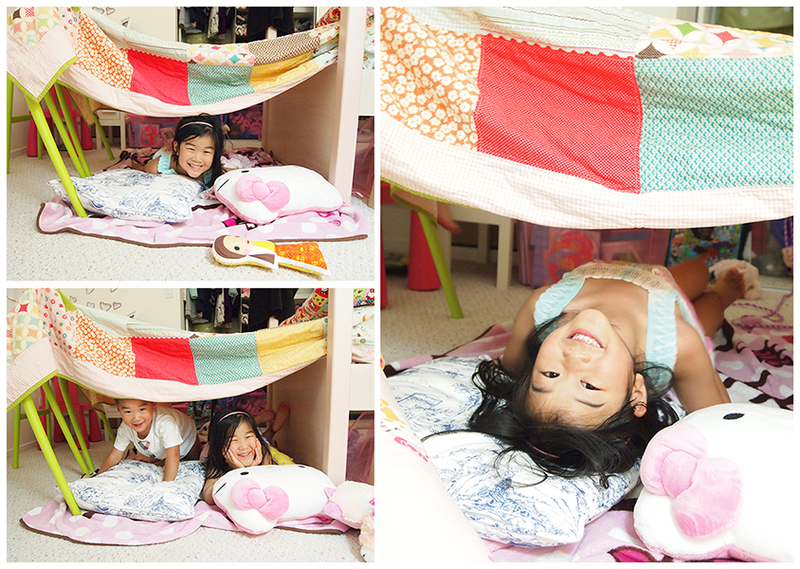 I had 2 skinny pieces of fabric leftover, measuring 6″ x 36″. Not really useful for anything else, besides juggling balls! I figured it could be something that the baby could play together with George, since February 10 is also George’s birthday. I’m not even making this up–Happy 7th birthday, old buddy! Hopefully, he’ll know not to rip these ones apart. 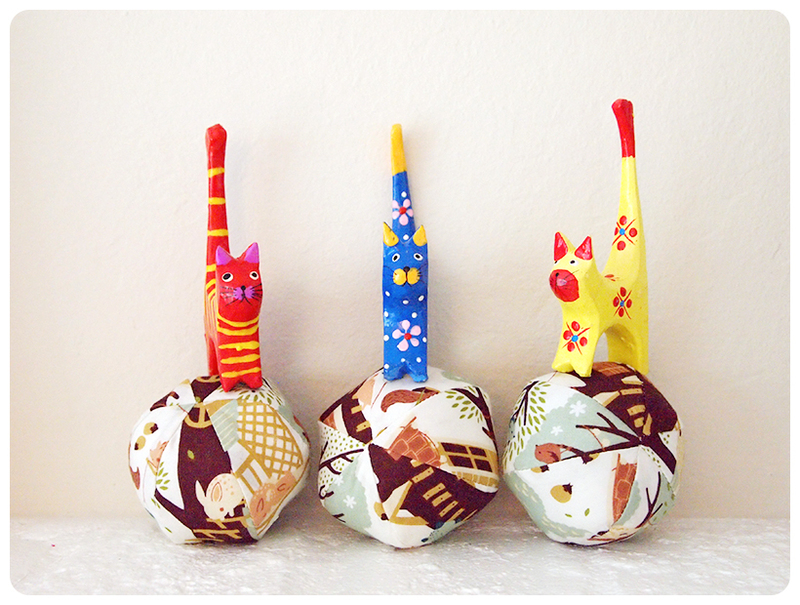 I placed a small rattle inside each ball, to add auditory stimulation to the development of fine motor skills. Having a baby is an incredible miracle of life. While looking through the photos of George, I found this one. It’s my favourite of the bunch. The mother-daughter bond is a strong one that keeps growing stronger. Congratulations to the new parents and welcome to the world, baby girl! The Froo & Boo family is celebrating with you. xoxo. 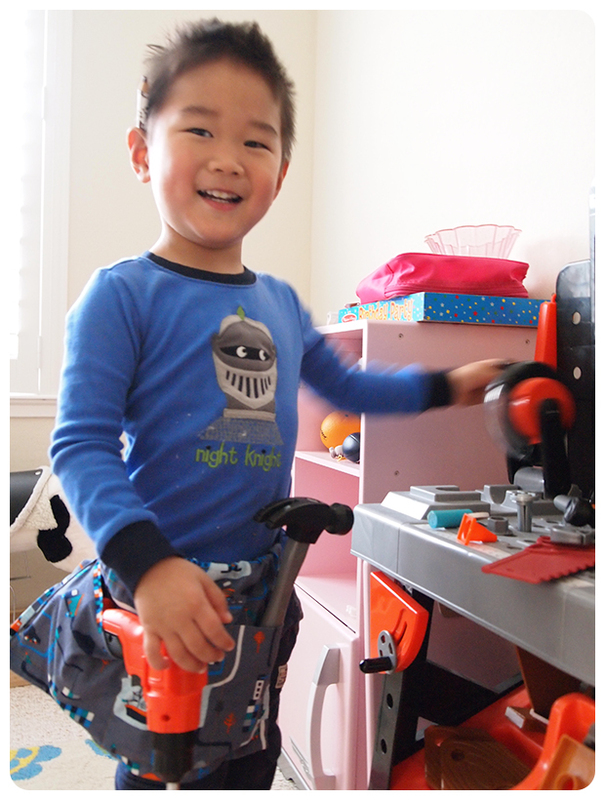 Boo loves construction trucks, rescue vehicles, trains, airplanes and tools. I used to cringe at the sight of fabric with dump trucks printed all over it. Now I welcome it with excitement for my Boo. His joy cannot be contained at the immediate recognition of the aforementioned objects of his love. I never thought I would know the difference between a backhoe, excavator and grapple skidder. Anyhoo, one morning, Boo & I were enjoying orange juice and coffee at Peet’s Coffee. 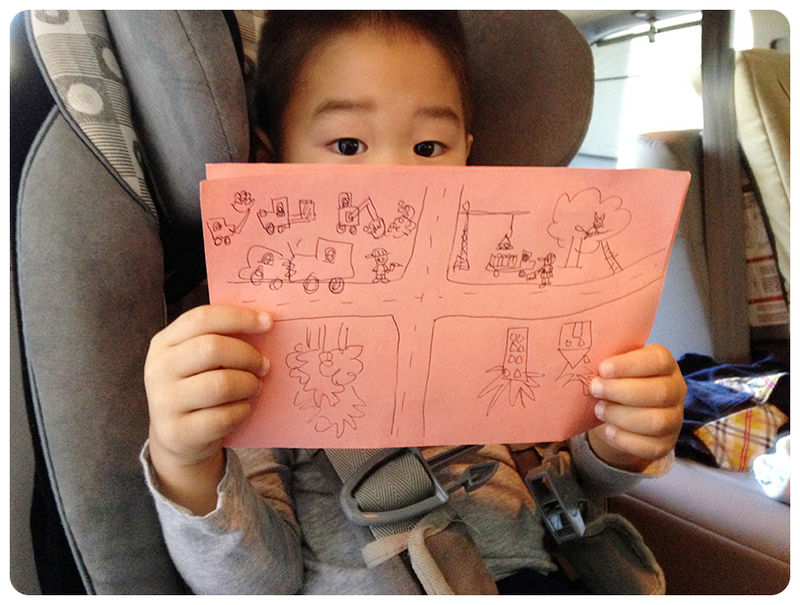 To keep Boo from squirming off his chair, I drew him a picture of a neighbourhood, so he could play with his little firetruck on the page and put out the fires I drew. I even drew him a cat in a tree, but really, don’t firemen have better things to do?? It kept him busy for a long time, so I knew I would need to make him one that’s more permanent. 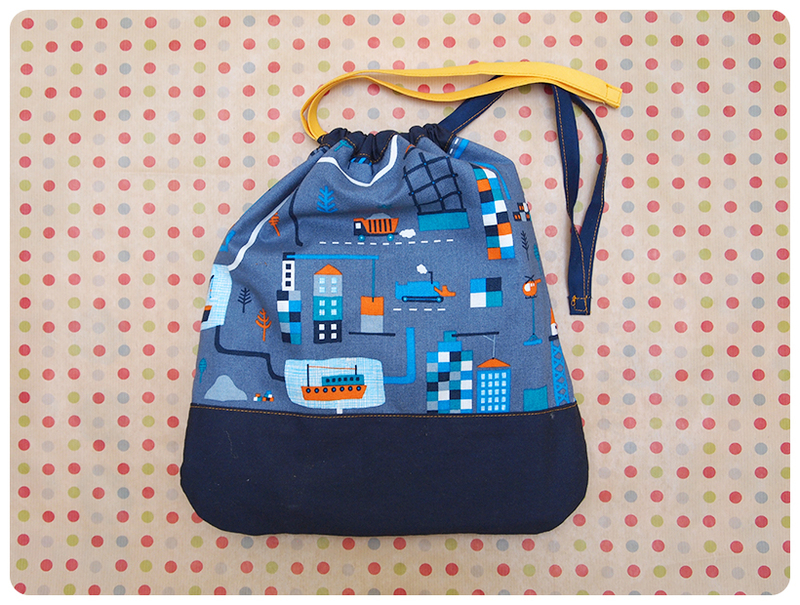 I started with the drawstring bag from the oliver + s book, “little things to sew“. 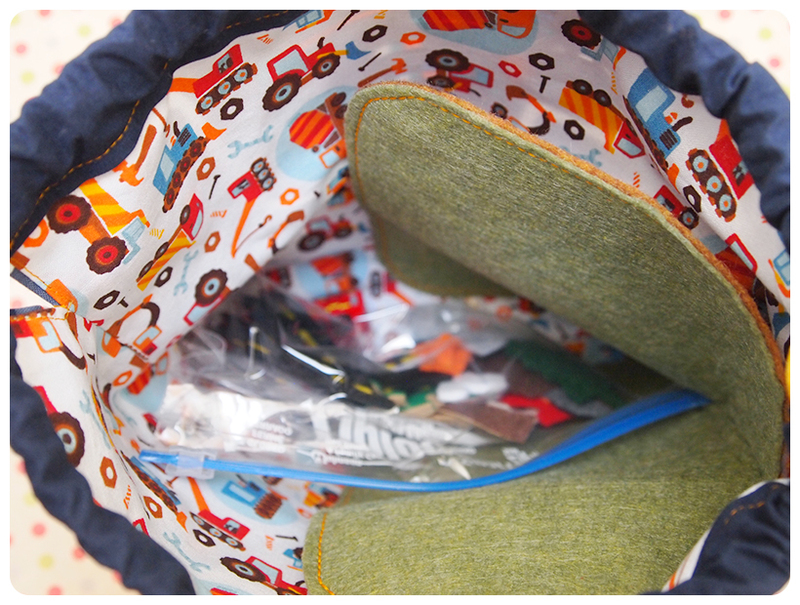 I wanted to make a bag that would be big enough for a placemat, all of the fun pieces and some of Boo’s favourite trucks. As always, this pattern does not disappoint! 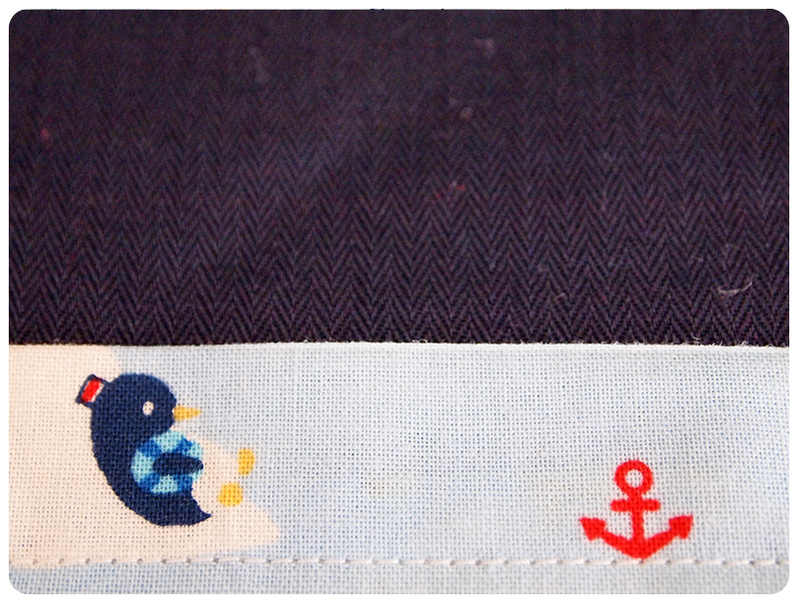 The outside fabric is organic cotton called Shipyard, by Timeless Treasure. The hubs picked it out for Boo in the clearance section, the time we went to Hart’s Fabric in Santa Cruz. The lining fabric is quilting cotton from Jo-Ann. 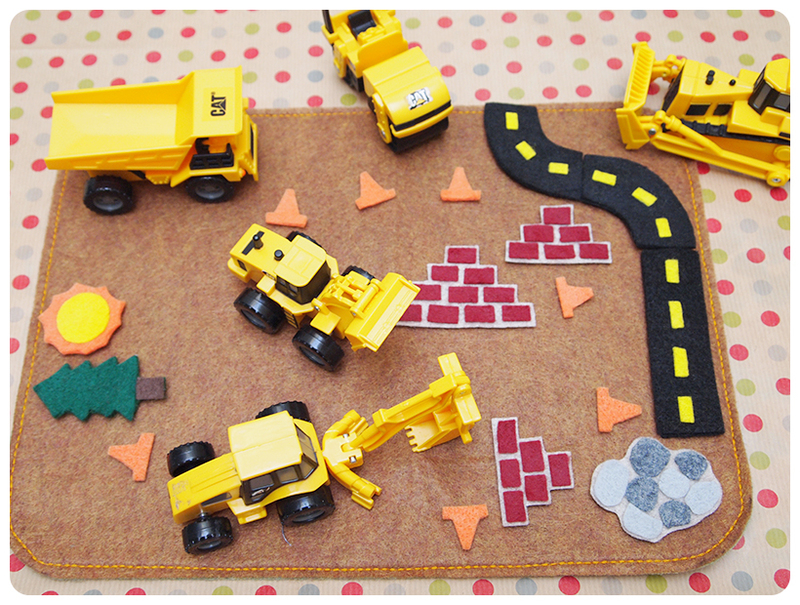 The placemat is double-sided, one for a grassy green landscape, the other, a construction site surrounded by dirt. 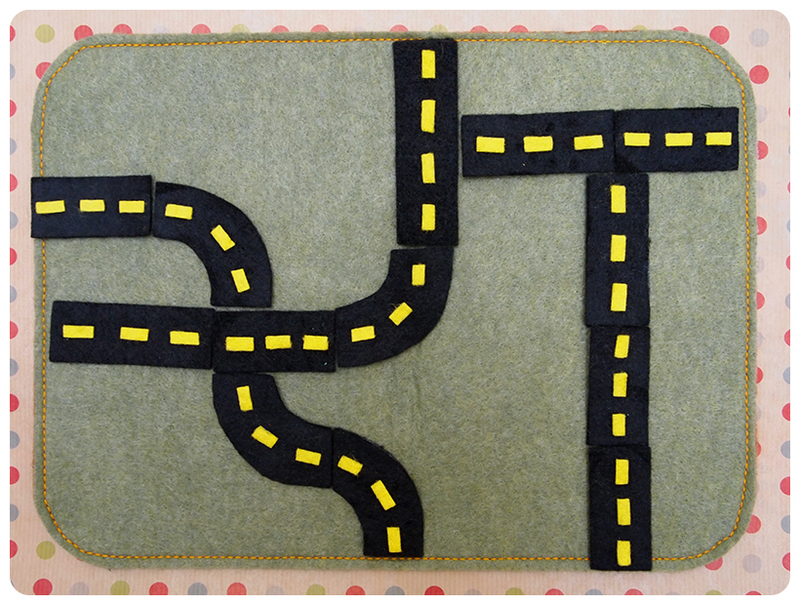 I fused the 2 pieces of felt together with Pellon Wonder-Under, which is sort of like double-sided tape. 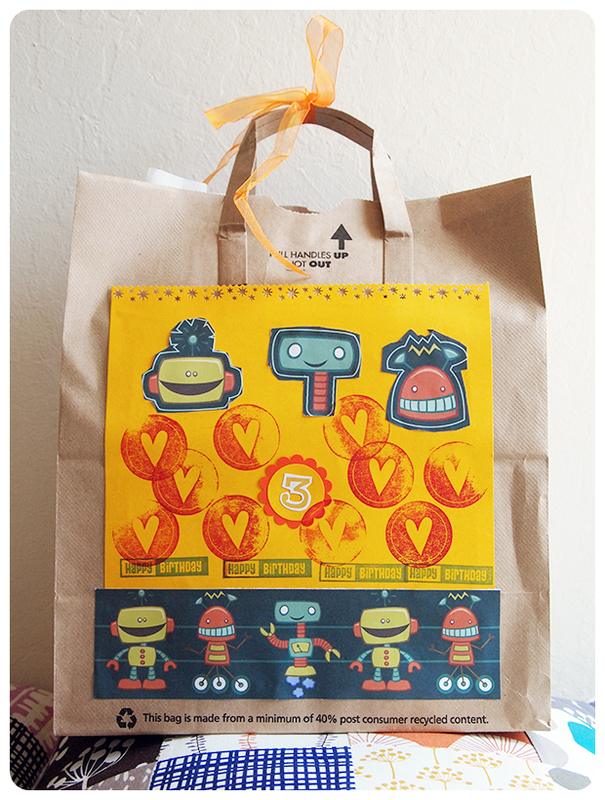 I added an orange triple-stitch around the edges to match the stitching on the drawstring bag. 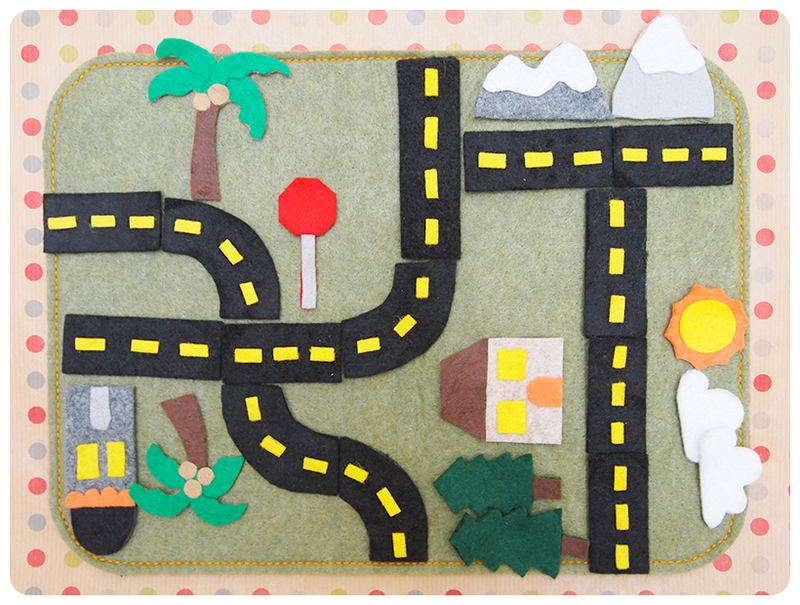 The rest of the project is made up of felt pieces. All of the pieces have at least 2 layers, fused together with the Wonder-Under. 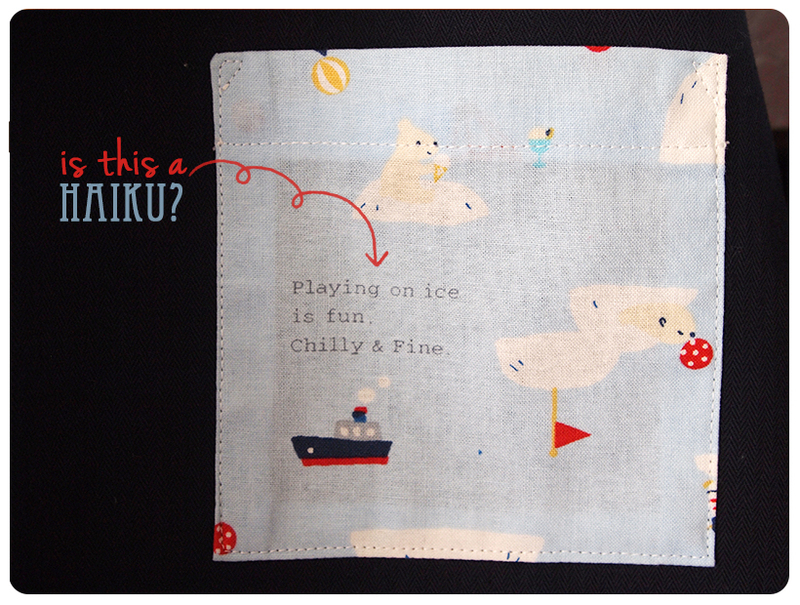 I did this to make the pieces more durable–some of the pieces from Froo’s quiet book are starting to rip and wear down. Also, the double-stick webbing makes the pieces nice and smooth, while still soft, which would not happen if I used glue. I put them in a clear Ziploc bag, making it easy to spot pieces. Oh no! There’s a fire at the house! Wee-wOO-WeE-WoO. Ok, time to build something. Off to the construction site! Boo loves playing with these decorative marbles. He uses the front loader to scoop them into the dump truck. 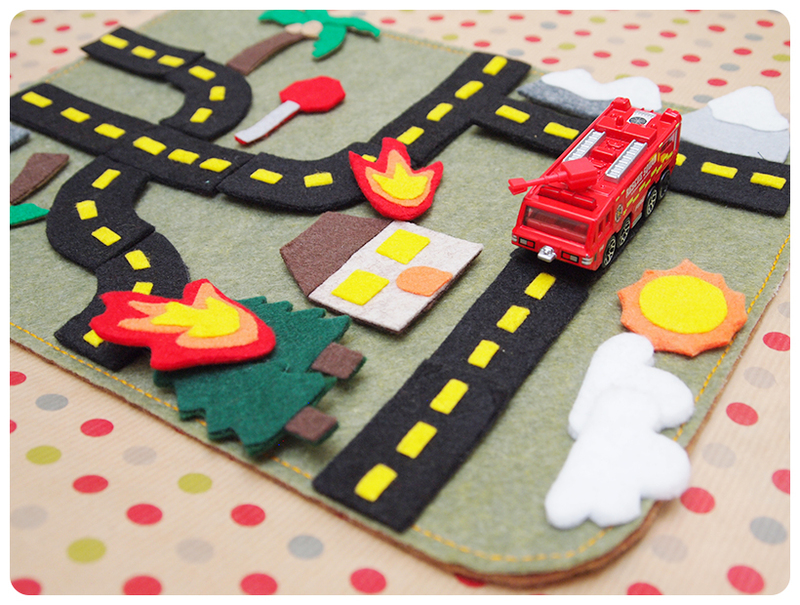 Here’s a quick photo tutorial of how to put the felt pieces together. Uh, please learn from my mistakes–I’m not sure how I’m going to clean my iron. Also, it’s a good idea to keep your desk clean, unlike mine, since the felt pieces are small and quick to disappear. I think this Christmas gift for Boo will be a hit! Nevermind that the perspective is way off, nothing is to scale and my felt pieces are lacking in detail. I think this placemat will keep him busy at a restaurant, which will make going out to eat all the better. Last night, Boo was not happy with his dinner, so he got up and walked to the door saying, “I’m going to drive daddy’s car and go to a restaurant. All. By. Myself.” My not-yet-3-year-old already sounds like a teenager. We got him to finish his dinner after threatening a lump of coal in his stocking. Some of the presents under the tree had already been “accidentally opened”, so this one will be hidden until the 25th. I’m hoping to get one last handmade gift done before Christmas! p.s. The amazing Lightning McStitch of Bartacks and Singletrack, is hosting a challenge to complete all 21 projects from the book! I’ve sewn up 5 projects from the book so far, this being my 6th. I love seeing all of the unique interpretations and the faces of little ones enjoying their handmade goodies. 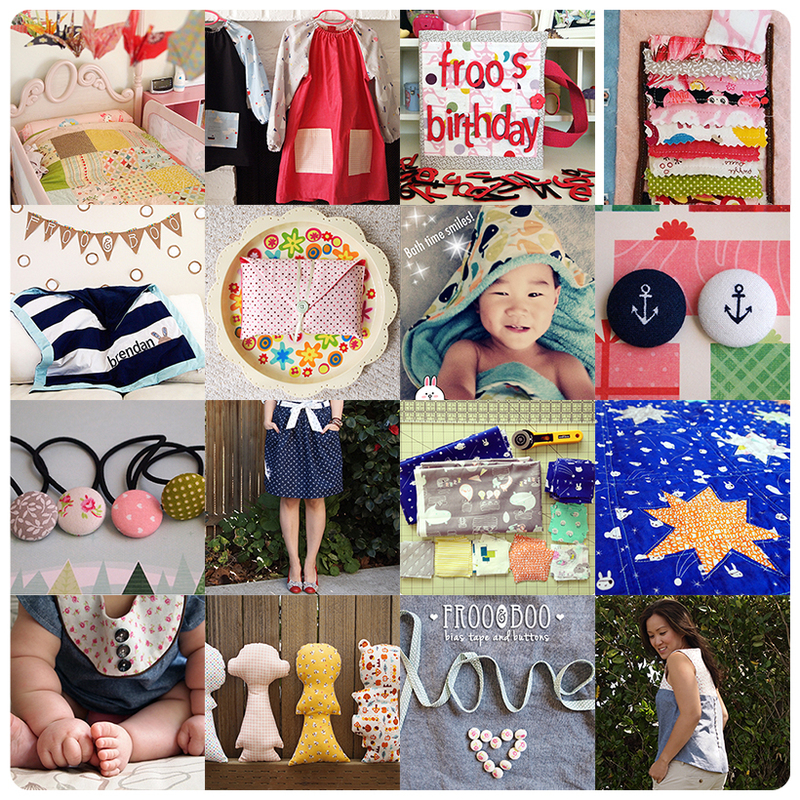 The flickr group is full of wonderful creations from the book! I made some balls. Balls for Froo, balls for Boo. 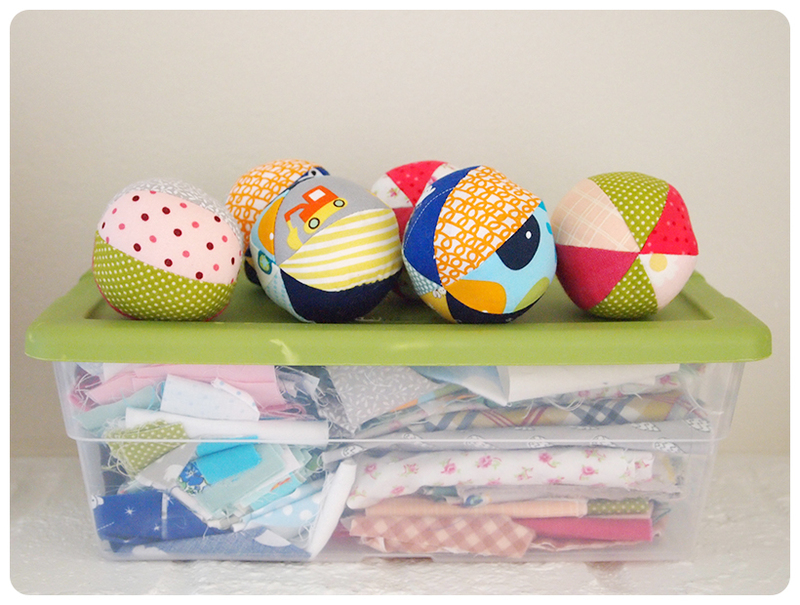 Fabric juggling balls from the Oliver + S book, “little things to sew“. They were a request from Froo. She said she wanted “stuffing balls” and tried to make one by clumping stuffing together, as one would make a snowball by gathering snow. I told her we could make fabric balls to put the stuffing into instead. Froo also picked some fabric for Boo since he was napping. Boo says his favourite colour is blue, but we both know that his “real” favourite colour is orange. 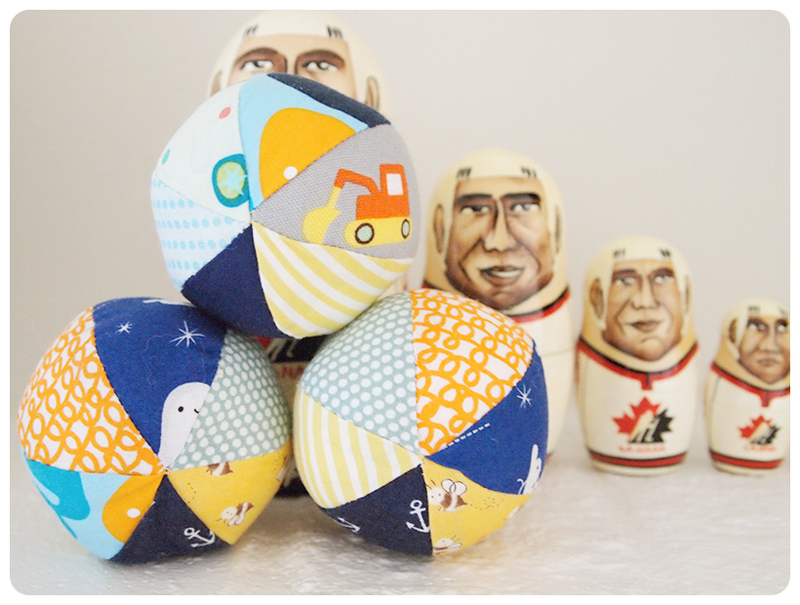 These balls were quick to make and they take up very little fabric. As much as I love fabric, I actually have a tiny fabric stash. I could fit all of my fabric in 3 large tote bins divided equally into 3 categories: quilting, apparel and knit fabric. My fabric scraps fit in 2 shoebox-sized tote bins: one for quilting fabric, the other for everything else. I save even the tiniest scraps! 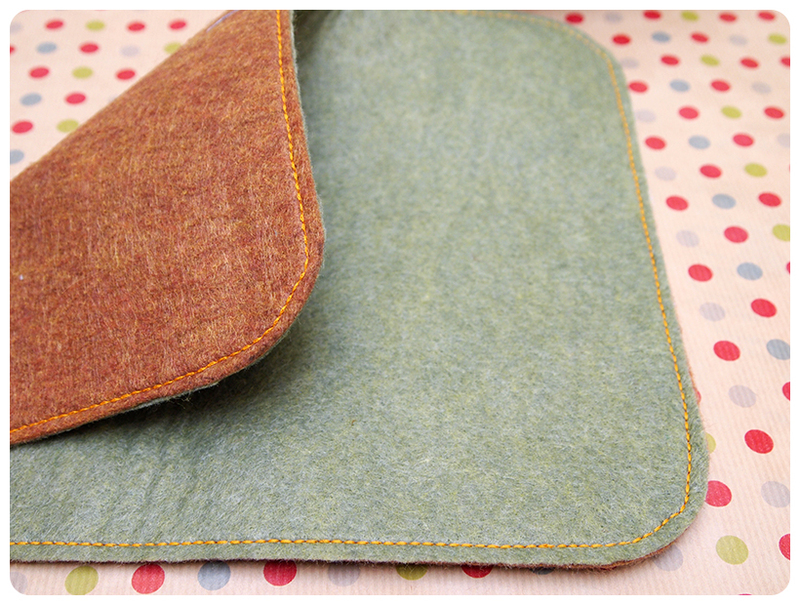 The other scraps get used up in small projects, like a door draft pillow. 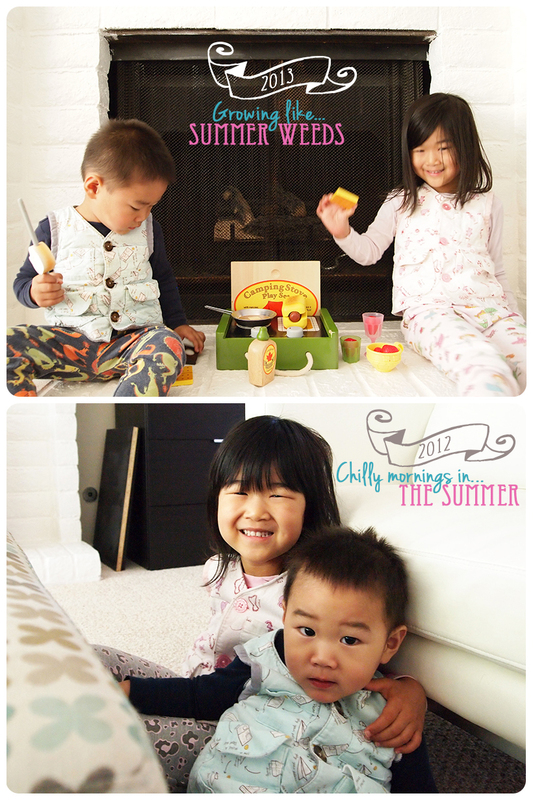 Now that Froo is in Kindergarten in the morning, we have the afternoons together while Boo naps. Froo was content to sort through the scraps, then fold and stack them back in the box. She helped me stuff all of the balls as well. 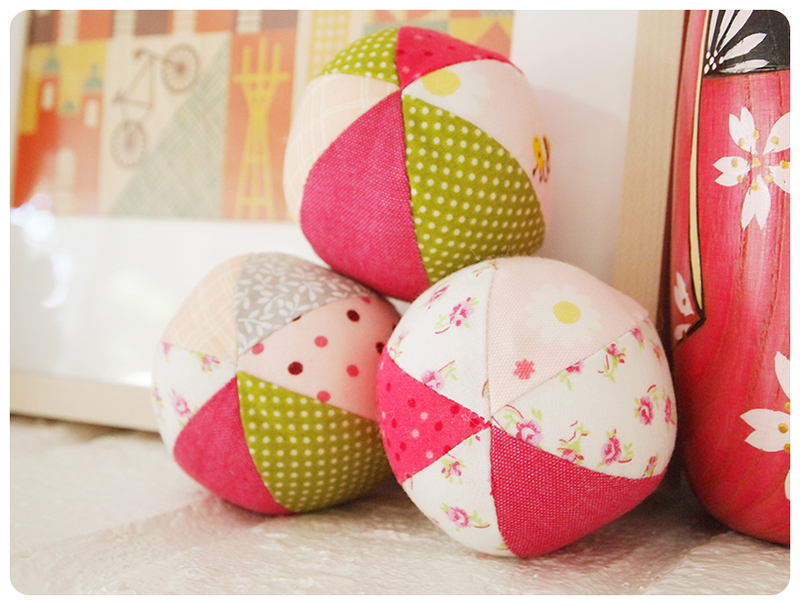 Inside each ball, I added a tiny beanbag filled with poly-pellets to give them a weighted feel. It makes them roll funny, which is all part of the fun. It makes me happy to make toys for Froo & Boo from remnants of previous handmade goodies, especially since Froo & Boo love their new juggling balls! For real. They both sleep with at least one ball each. They play with them in the car. They make up games with the balls, marking off areas on the carpet with washi tape as targets. 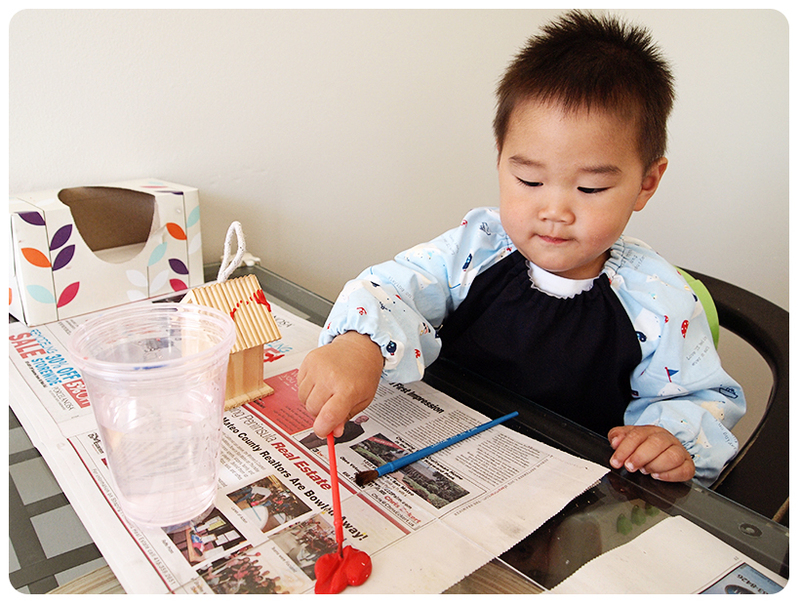 I have no idea where Froo gets her ideas–I simply observe with wonder at how small and simple toys can stimulate such imaginative play. 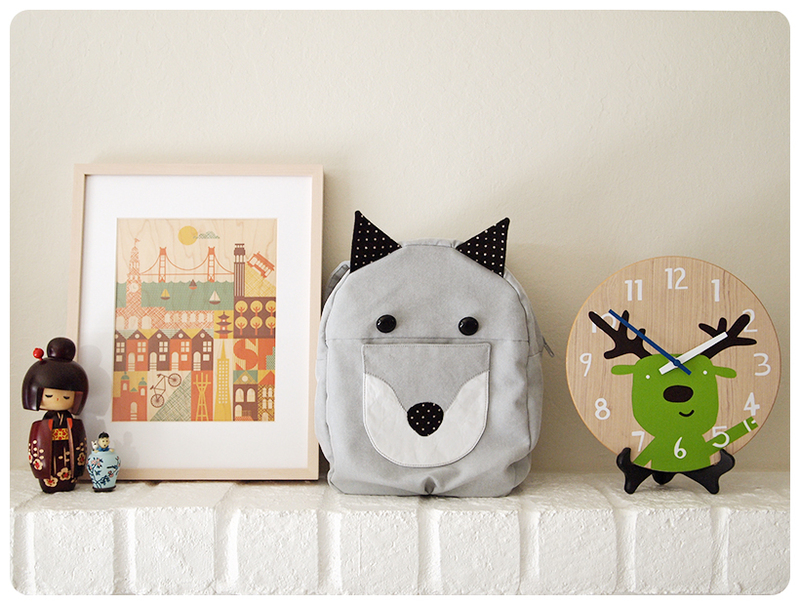 Can you tell that I love rearranging the little decorations on the fireplace mantle? 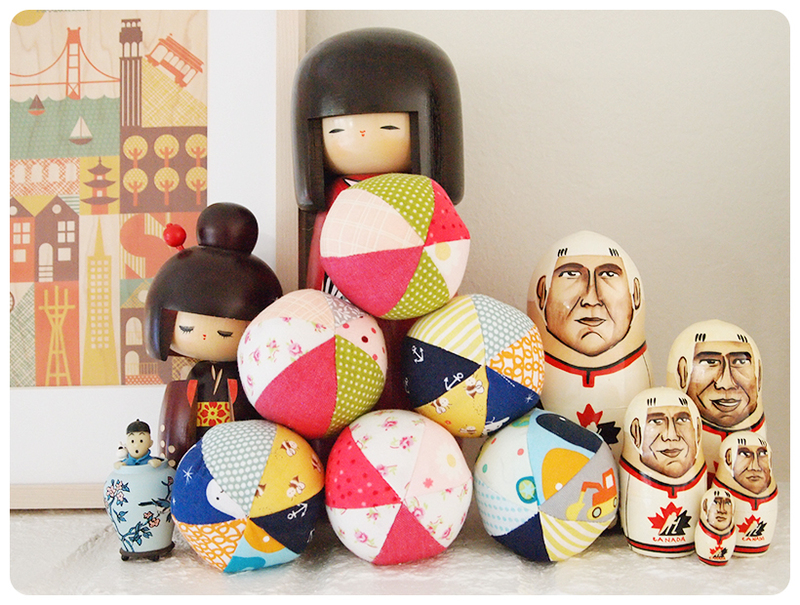 The hubs and I used to collect wooden dolls on our travels. 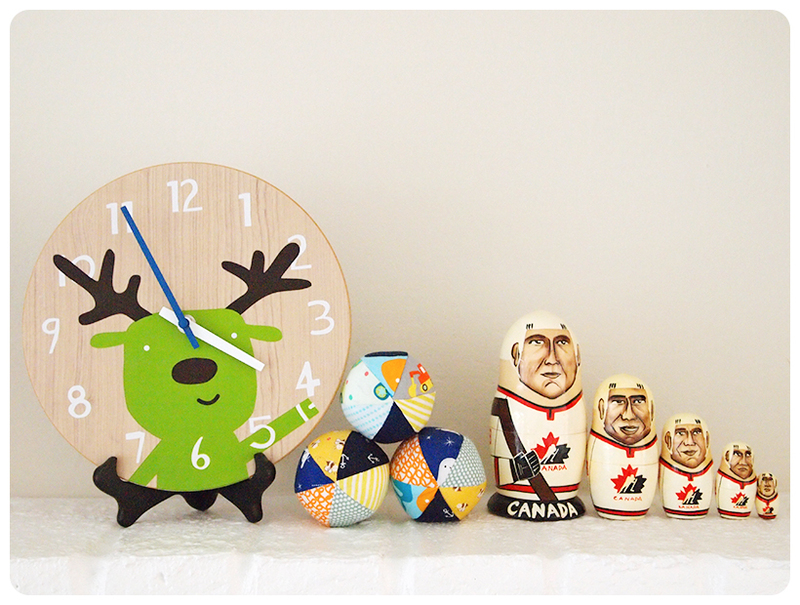 We bought the Team Canada (1998 Nagano Olympics) nesting dolls in Prague. The wooden girls are from Japan. Tintin (not wooden) is from Paris. 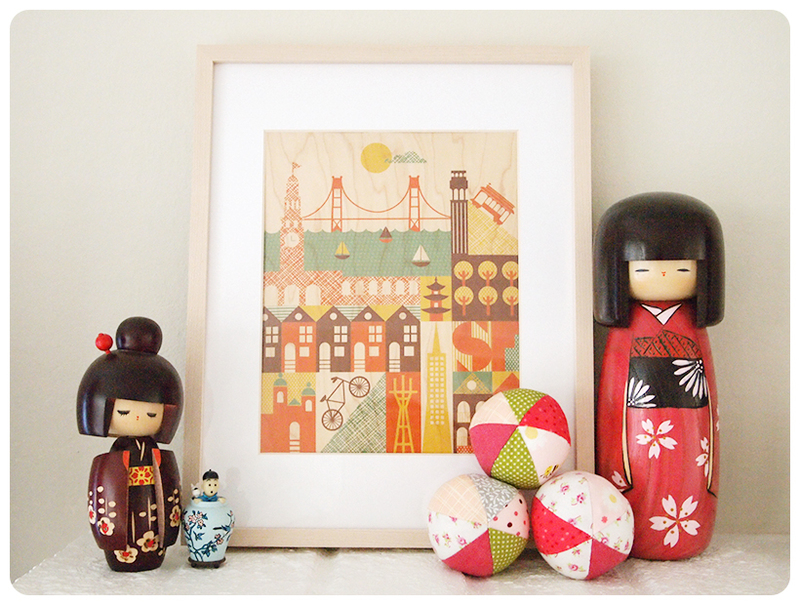 The San Francisco print on wood was purchased at the Renegade Craft Fair last year. Sometimes the little things give the big things their significance. 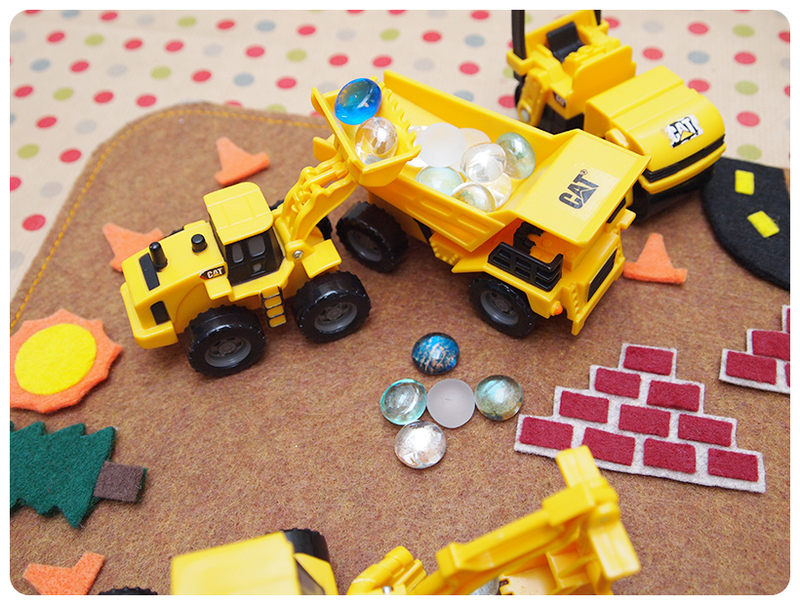 Boo found the smallest scrap with construction trucks and held onto it tightly, asking me to use it in a ball. That fabric was used to make his drooly bibs ages ago! I didn’t blog that one because it went missing and I later found it with a bunch of others in a suitcase. This small scrap brought me back to a time when Boo was a newborn–all the angst, love and care focussed on keeping this precious new baby alive. I still worry about keeping Boo alive–not from my negligence, but his own boyish and crazed adventure-seeking carefree nature. To view details on any of these projects, click on the Photo Index link above. 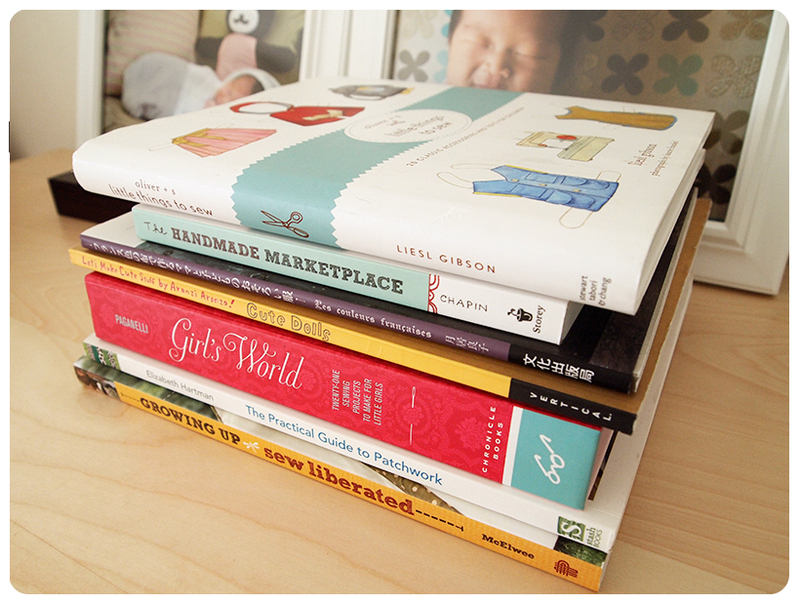 As for the book “little things to sew”, the more I sew from it, the more genius I think it is. 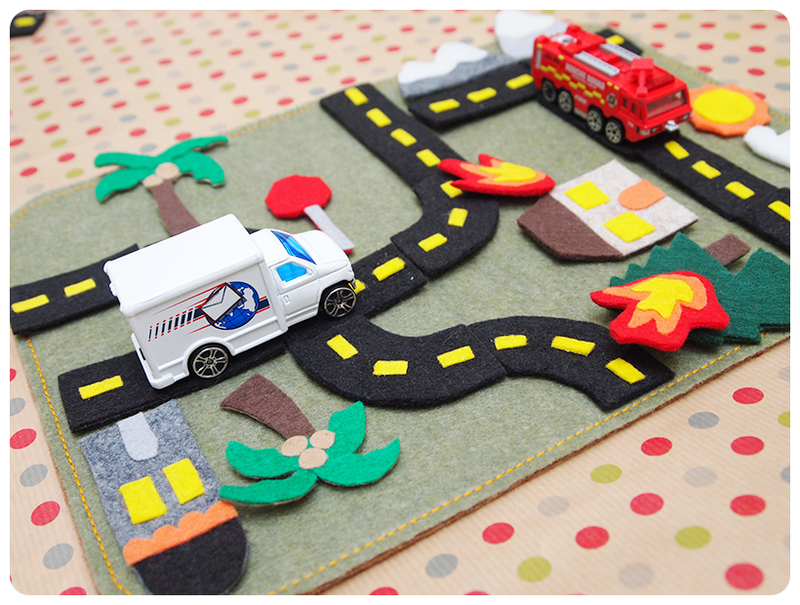 It is the perfect combination of useful, cute and child-appropriate fun–with the addition of excellent instruction for basic to advanced sewing techniques. I’ve learned oodles from this book, giving me the confidence to try more challenging sewing projects. There are oodles of happy little things going on right now. I made some balls. I’m pretty happy with that. Happy Grey & Canada Day! Boo’s best buddy’s name is Grey. 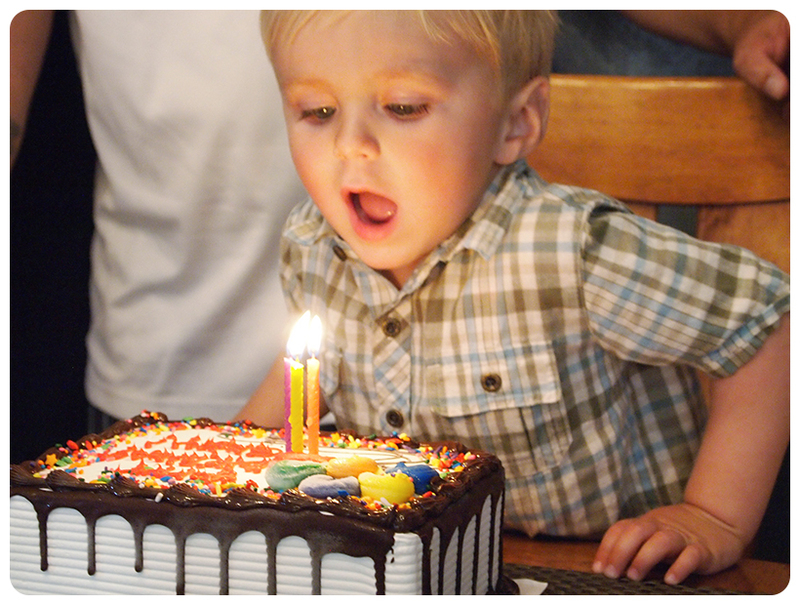 Today is his 3rd birthday, which happens to land on Canada day–happy birthday to both boy and country! I knew I wanted to make the birthday boy something grey, so I searched my sewing books and the Internet for some ideas. 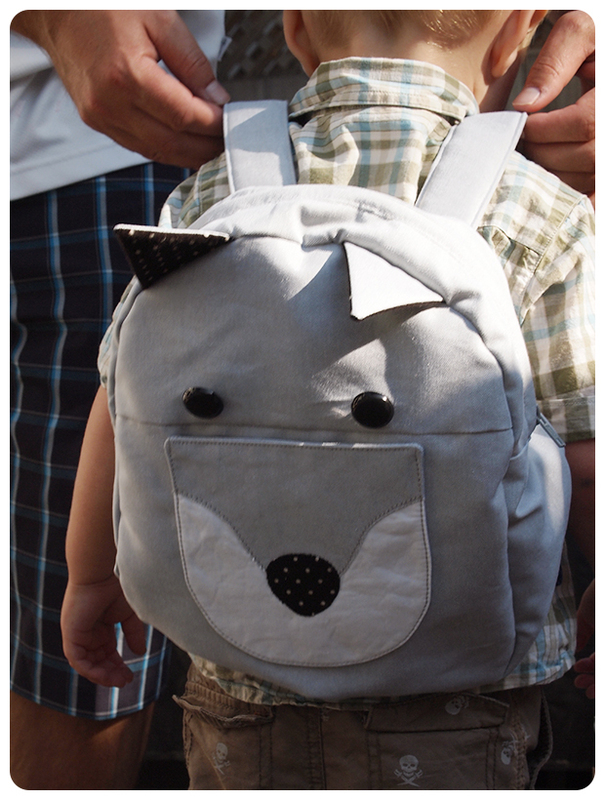 I decided on using the Oliver + S backpack pattern from the book, “little things to sew“–using a grey fox instead of a penguin. I think foxes are adorable. Normally, I would shy away from a time-consuming, detailed project like this, but after I had decided on a grey fox backpack, I was determined. The instructions were many, but well-written and easy to follow–I was able to get a little bit done at a time, over the span of a week. 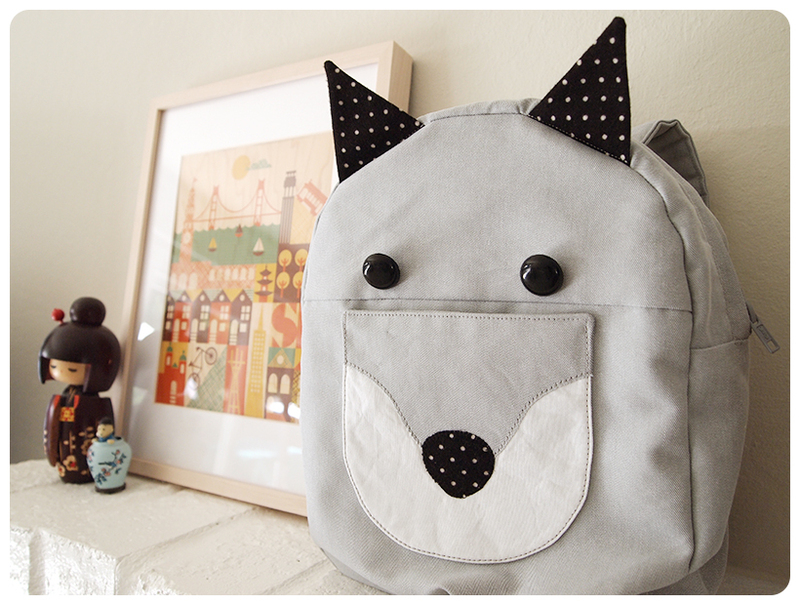 I’m glad I made this cute backpack–I love how it turned out! I used Pellon Wonder Under to applique the face onto the front pocket and secured it with a triple stitch. The ears and nose are a polka dot print on flannel. The fabric is a bottom-weight fabric, similar to denim, with a silver metallic sheen to it. 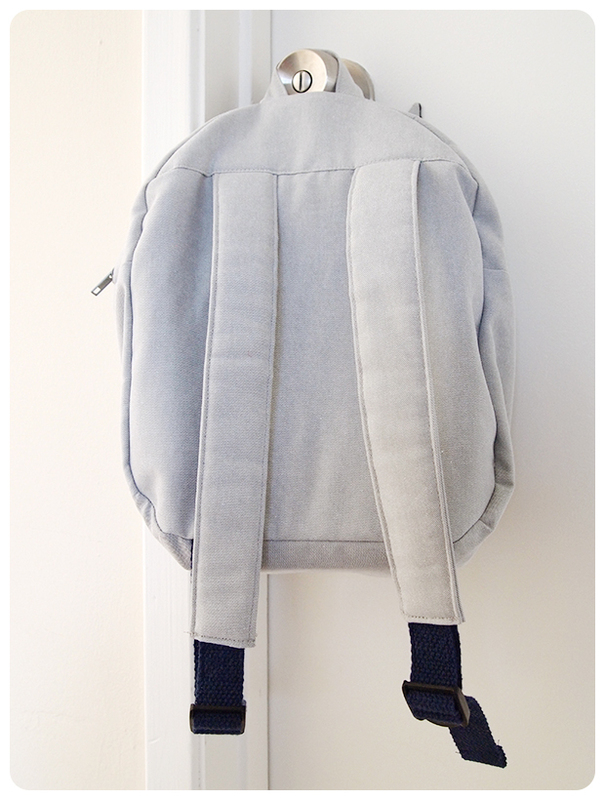 I added fusible fleece to the back panel of the backpack, to provide comfort with the extra padding. I also added fusible fleece to the straps and modified them because I could only find 1″ strap adjusters. 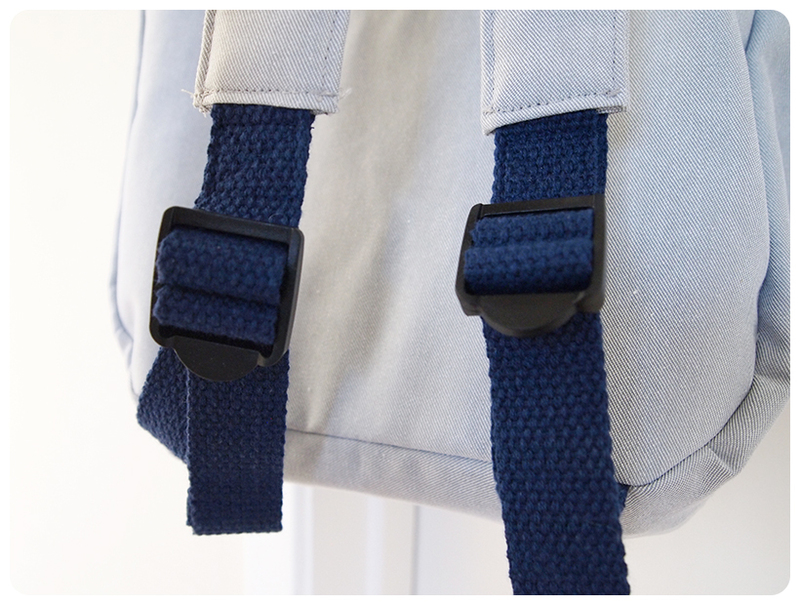 I copied the straps on Froo’s backpack–shortening the straps in half and attaching a bit of 1″ navy cotton webbing to loop around the strap adjusters. 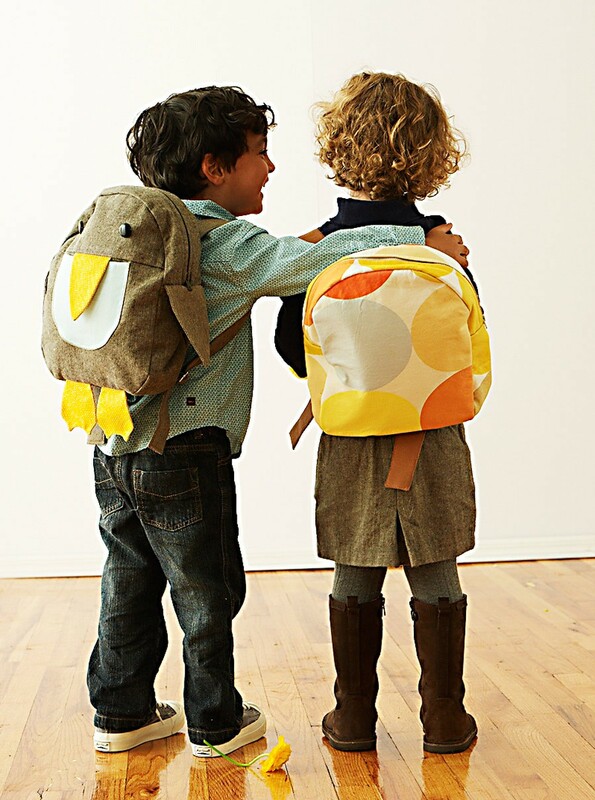 I sewed longer cotton webbing to the bottom of the backpack, looped it through the adjusters and sewed the edges down. 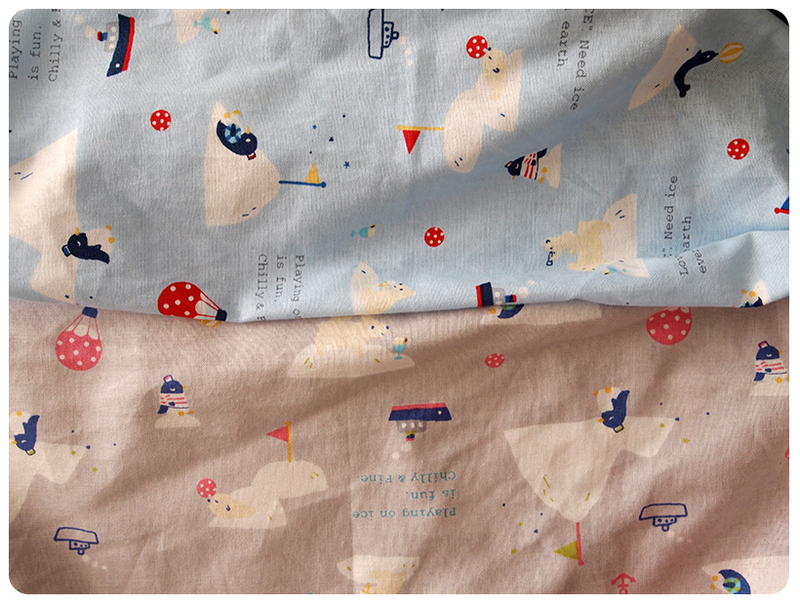 The lining is very cute–grey, aqua and white woodland animals. There are foxes printed on it! 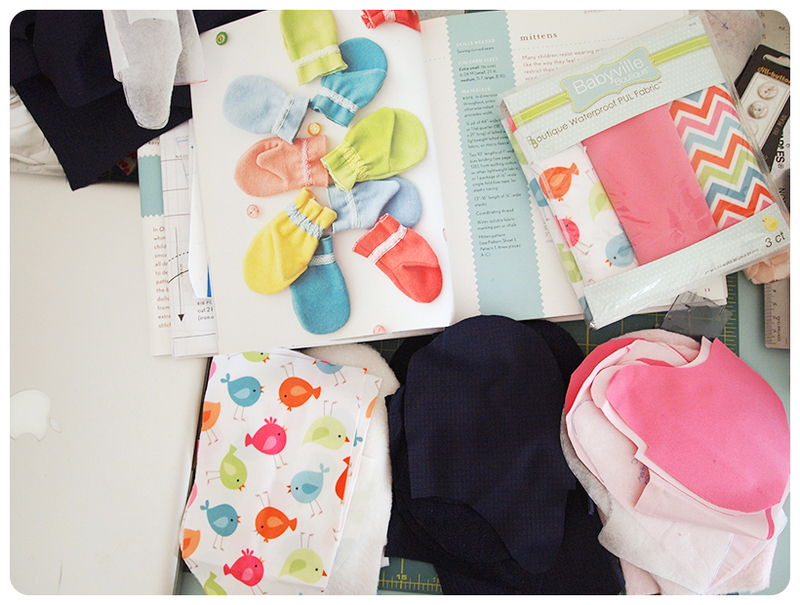 Both the outside & inside fabrics are from Jo-Ann. 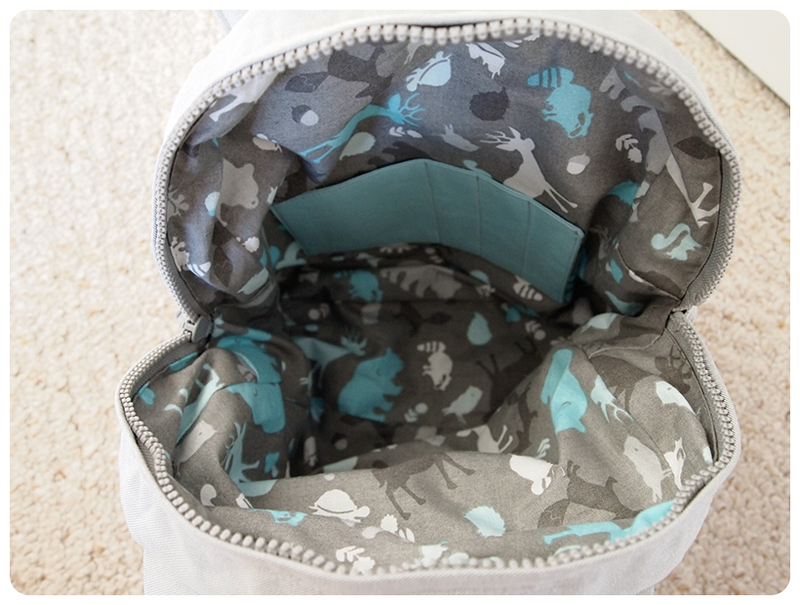 The divided pocket is Kona Aqua, leftover from Froo’s open wide zipper pouches. 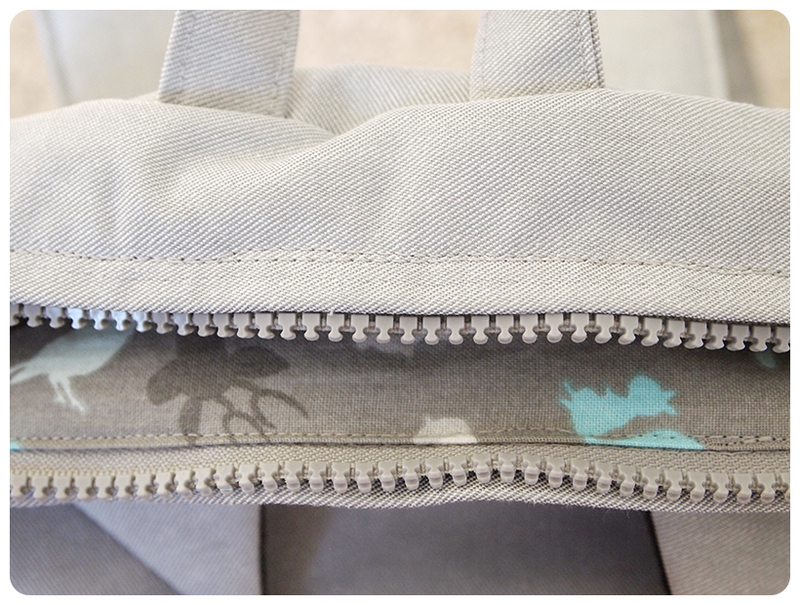 To save time, and my sanity, I decided to machine stitch the lining to the zipper tape using my zipper foot. I tried to get the lining as close to the first set of stitching as possible, but there are a few wobbly spots. I’m pretty sure a 3 year old boy won’t mind! Even though Froo & Boo love electronic gadgets, sometimes it’s the old-school toys–like the View Master–that keep them entertained at a restaurant, or waiting room. 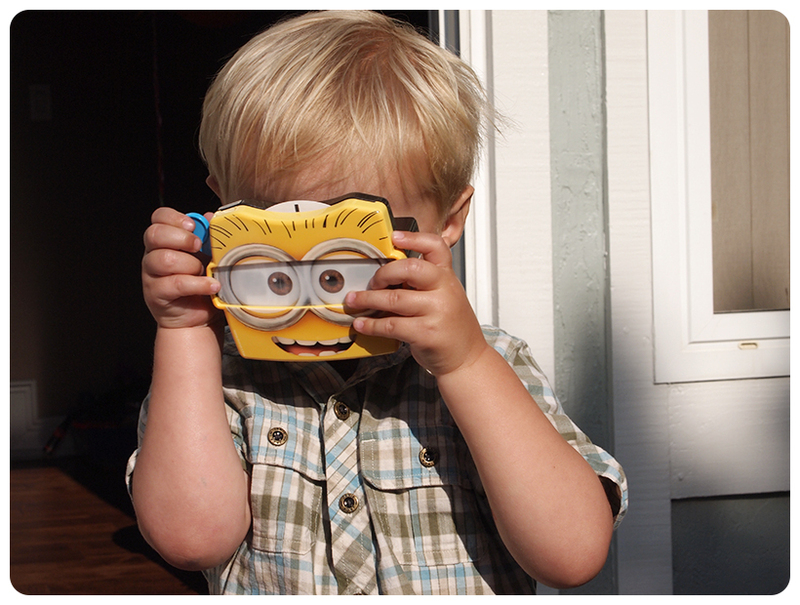 One of Grey’s favourite movies is Despicable Me. 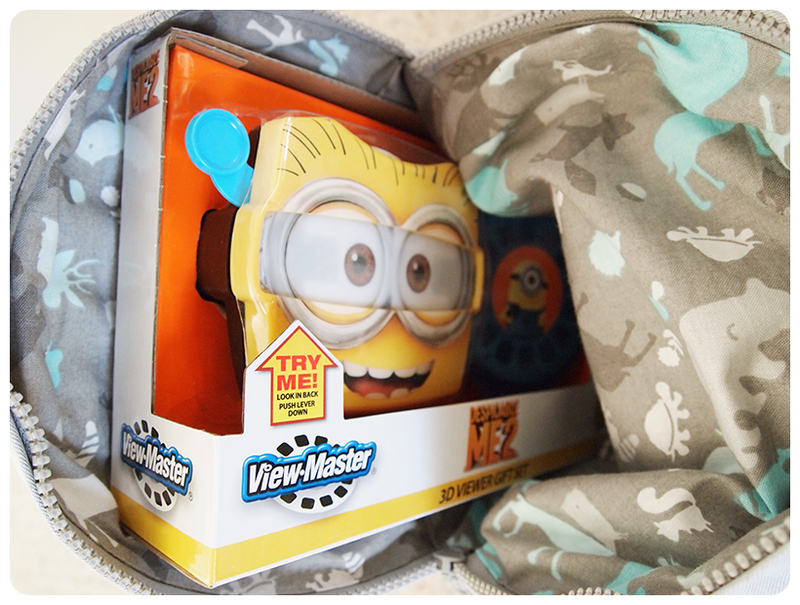 I was surprisingly touched by the movie and have already made plans with Grey’s mommy to watch Despicable Me 2 altogether! Happy happy birthday, Grey! 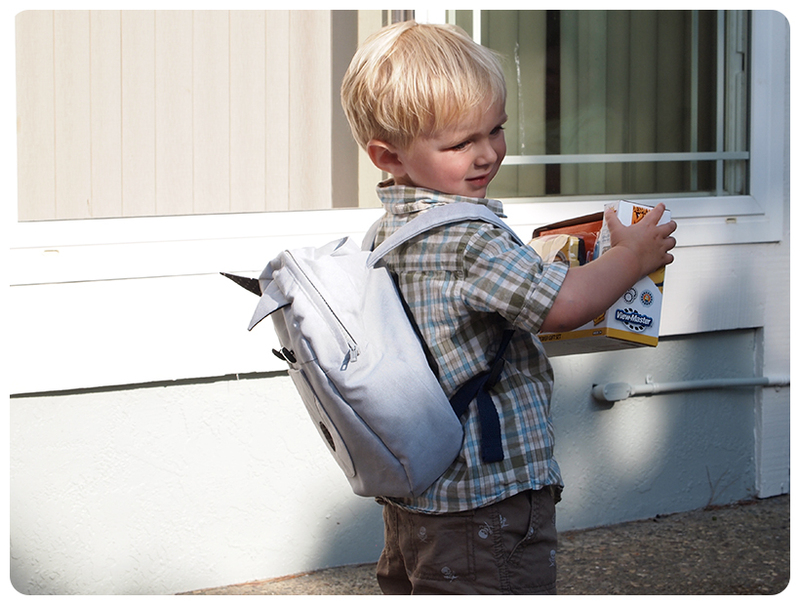 We hope you fill your backpack with meaningful things that will give you a life full of adventure and happiness! 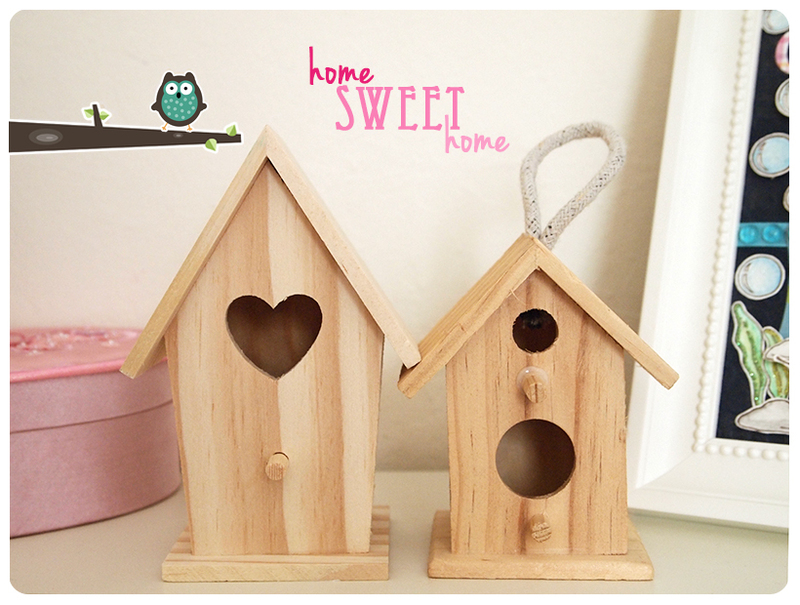 We found these cute birdhouses in the $1 bin at Jo-Ann the last time we went. I think they look lovely in their natural state. Froo insisted that we paint them and put them in the backyard beside the birdbaths (bowls filled with water and leaves) that she put outside. 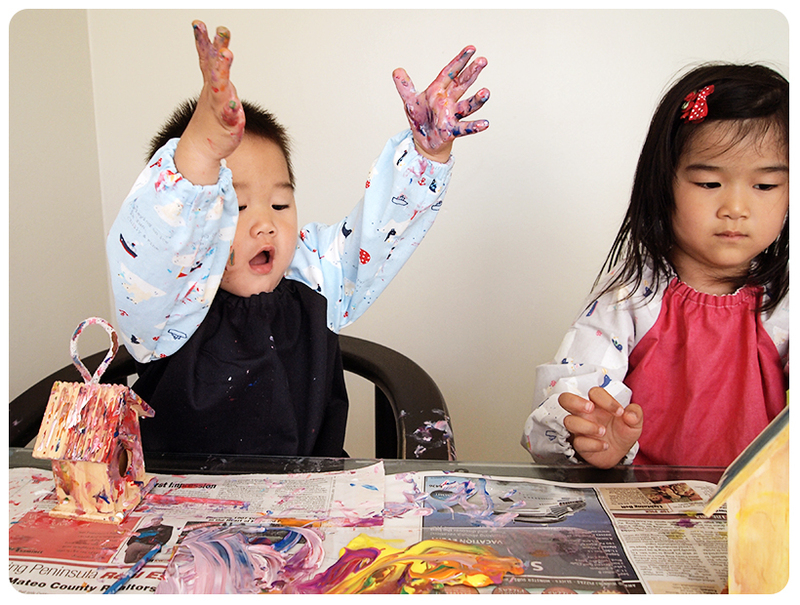 So I told her we could paint them as soon as I made some art smocks. She’s been waiting patiently and now they are done. 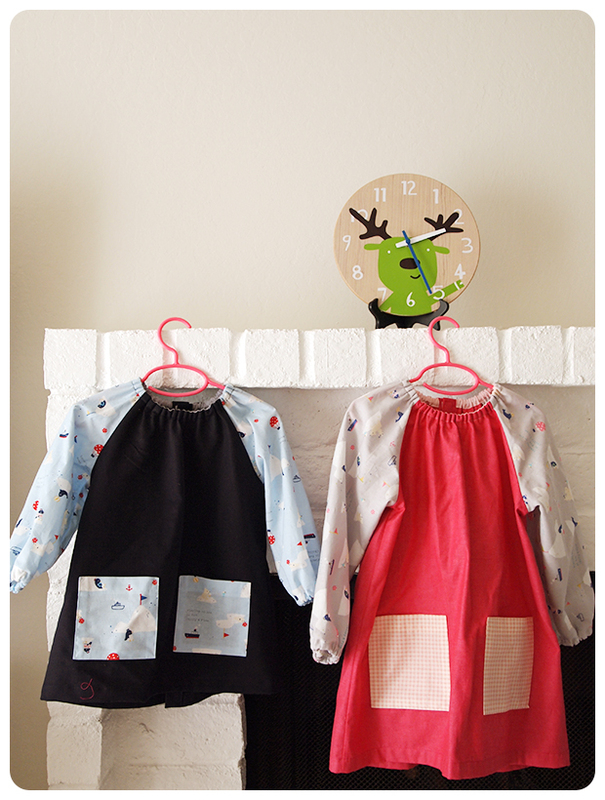 The art smock pattern comes out of the “oliver + s little things to sew” book by Liesl Gibson. It is my favourite sewing book. 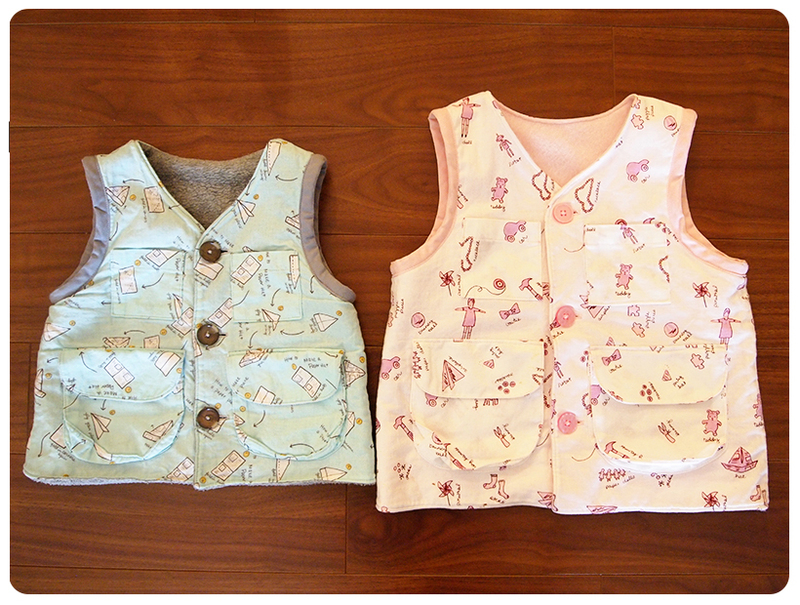 I’ve only made the explorer vests so far and they are worn almost everyday by Froo & Boo. 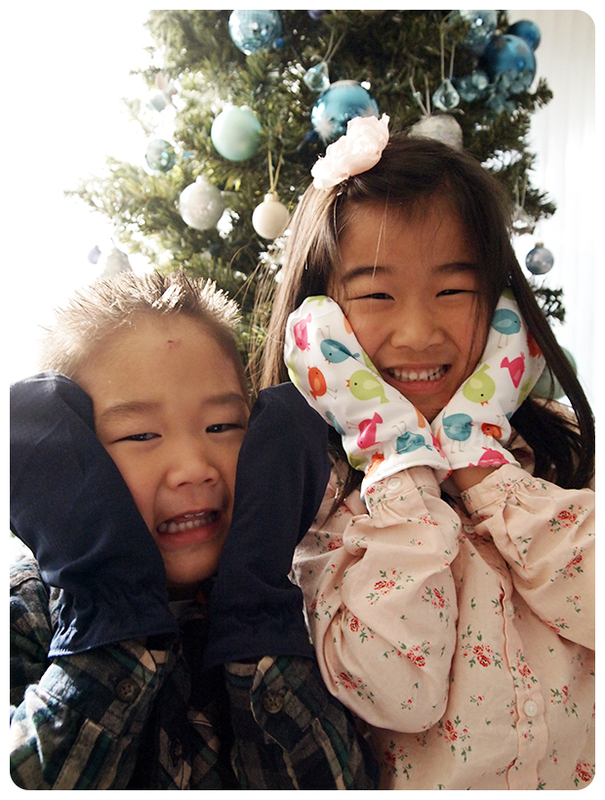 I used fabric from the Sarah Jane “Children at Play” collection and lined the vests with fleece to make them nice and cozy. 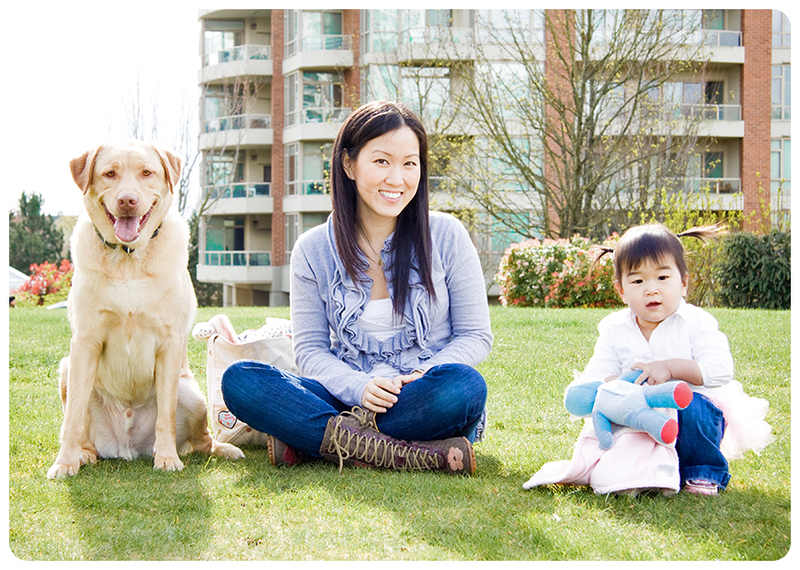 This next picture was taken in March 2012, in our old Burnaby home. I miss our floors. 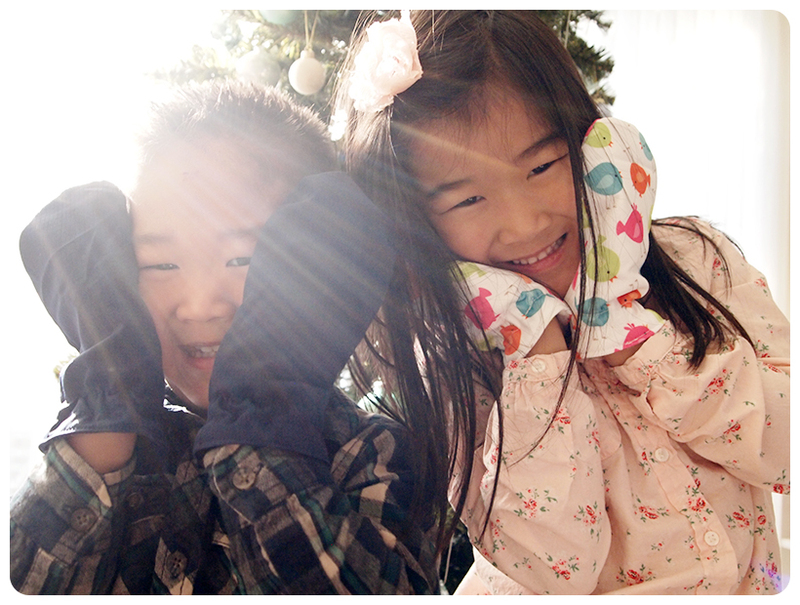 The mornings in the Bay Area are quite chilly, so Froo & Boo wear the vests until they get dressed for the day. 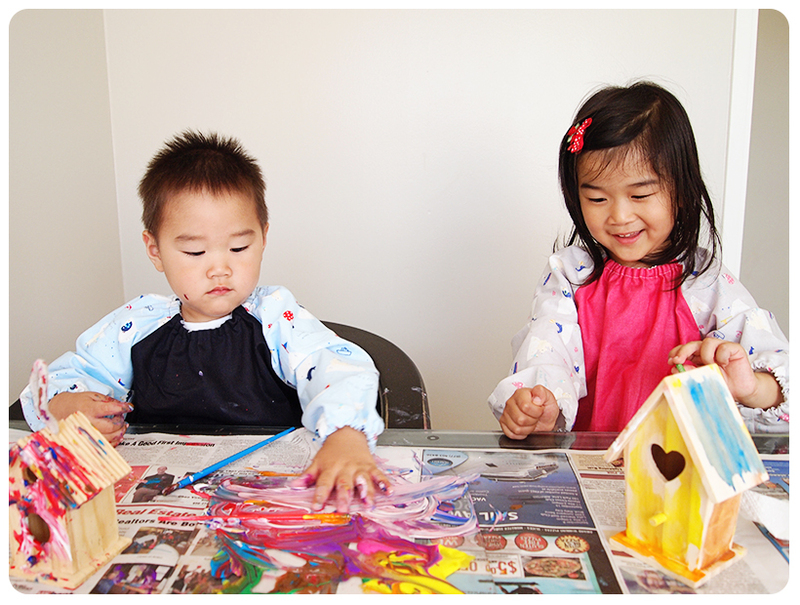 The finished art smocks. It is surprisingly detailed for what seems a simple project. 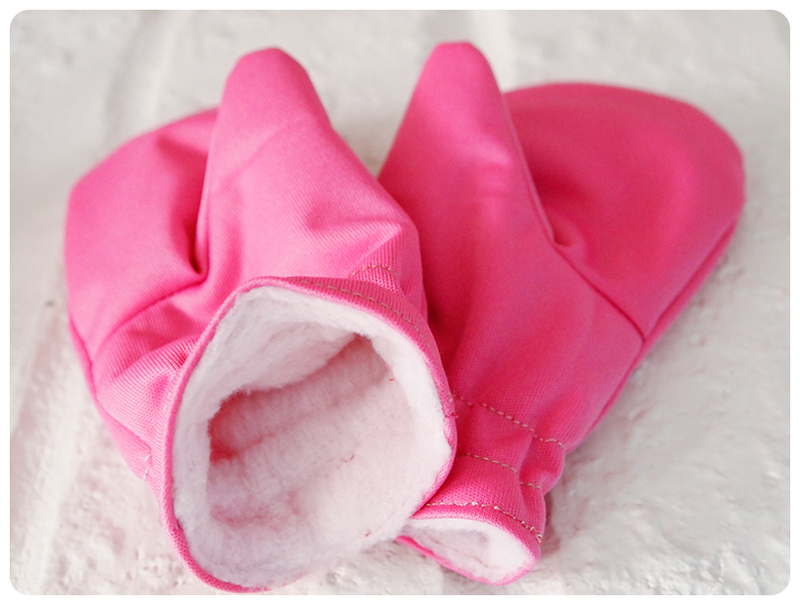 The seams are all encased French seams and everything is professionally finished. 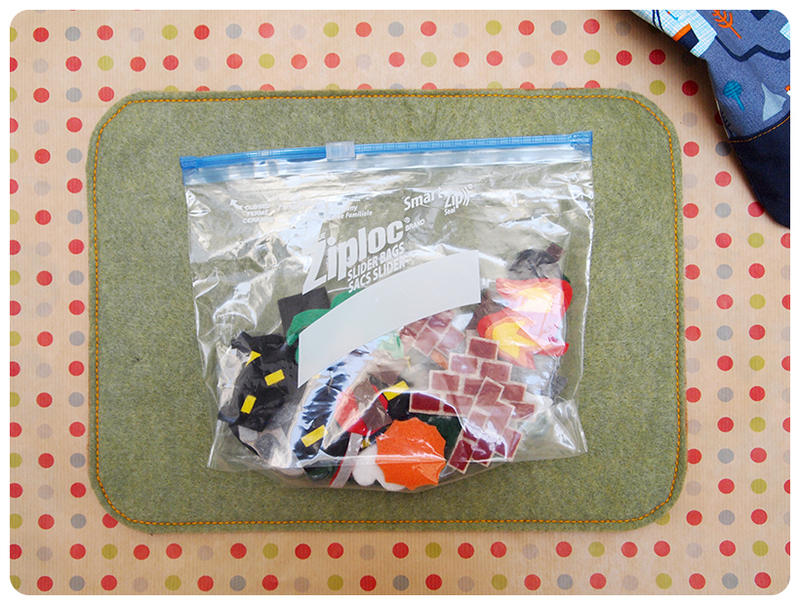 For both art smocks, I pulled out fabric from my clear tote bins and I had all the notions on hand. I think this means I have too much fabric. The raglan sleeves were made with a Japanese Lecien print that was on sale at superbuzzy. I only bought half a yard of each colour, thinking I would use them in a future project. The next time I buy cute fabric to save for later, I think a minimum of 1 yard is required. I didn’t have quite enough for Froo’s pockets, so they were made from leftover fabric from her fly a kite quilt. 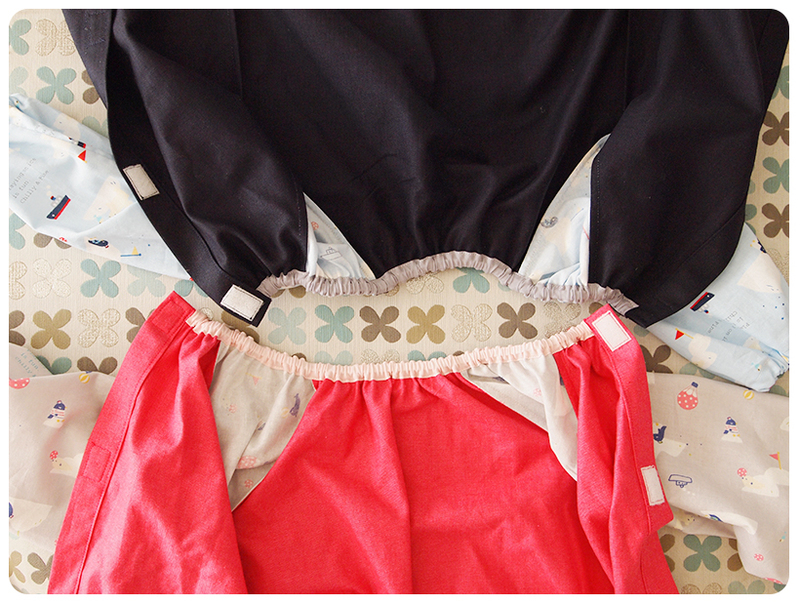 I still had second thoughts about using this fabric because I didn’t have quite enough for Froo’s sleeves, so the direction of the print on her smock is vertical, rather than horizontal, as on Boo’s. I don’t think Froo noticed, yet. That girl notices everything. 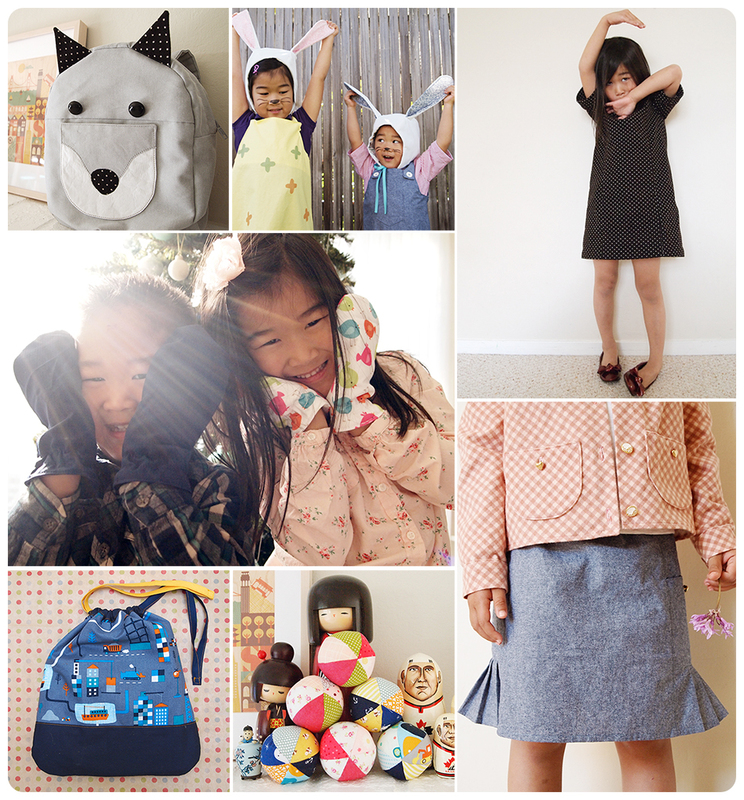 Boo’s art smock was made from a herringbone fabric that I used to make a Wiksten Tova dress. 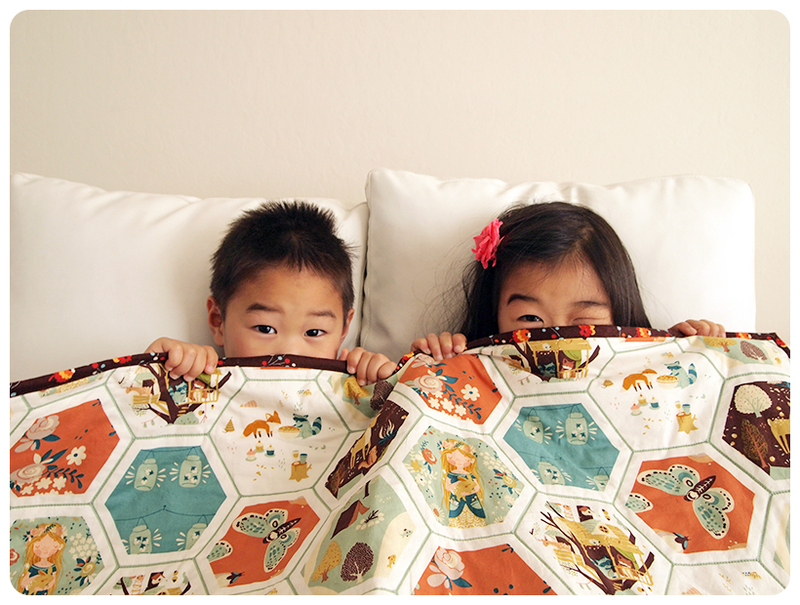 It is 100% cotton and much heavier than quilting fabric. It has a bit of sheen to it, adding texture and depth. 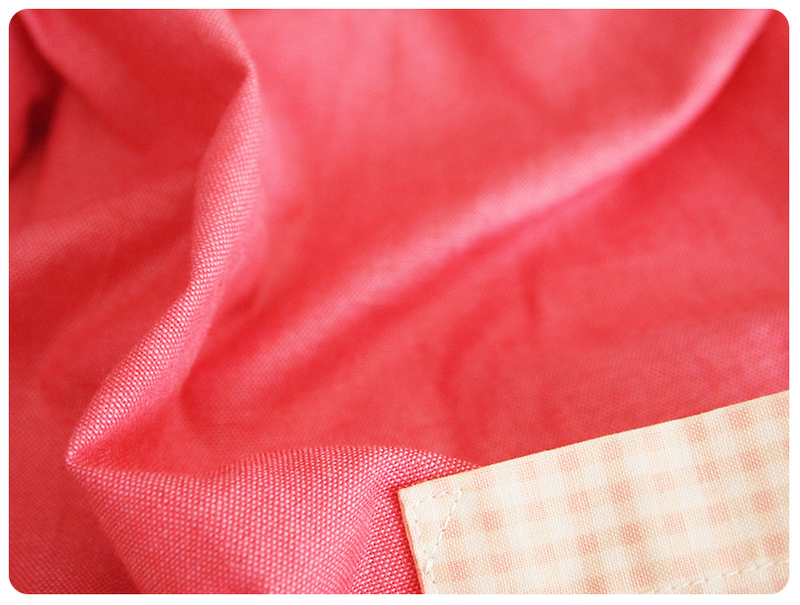 Froo’s fabric is from Moda Cross Weave. I bought a remnant at Peapod Fabrics in San Francisco after a day of exploring the California Academy of Sciences. 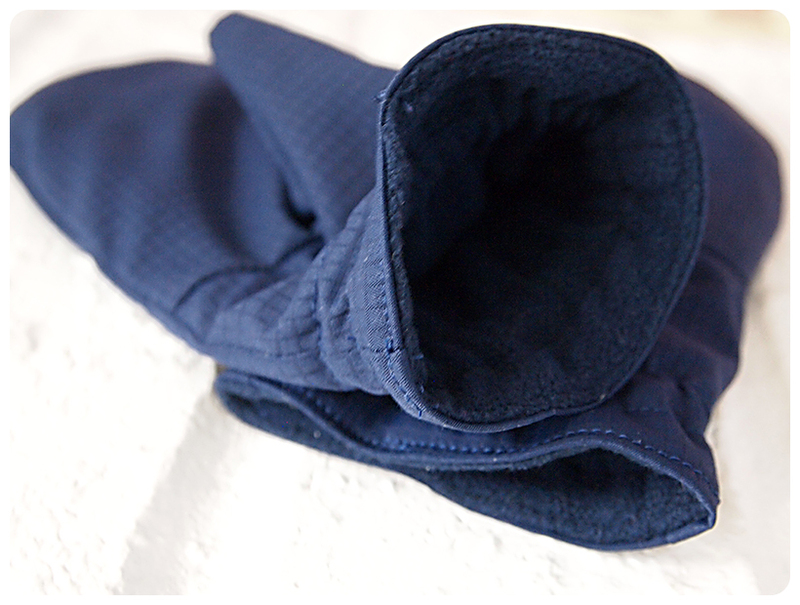 Since it is woven with two colours, the fabric has almost an iridescent quality and it’s super soft. I used leftover double-folded bias tape from the explorer vests for the neckline of the art smocks. I made Boo’s in size small and Froo’s in size medium. They fit perfectly. Boo seemed to be really focused. 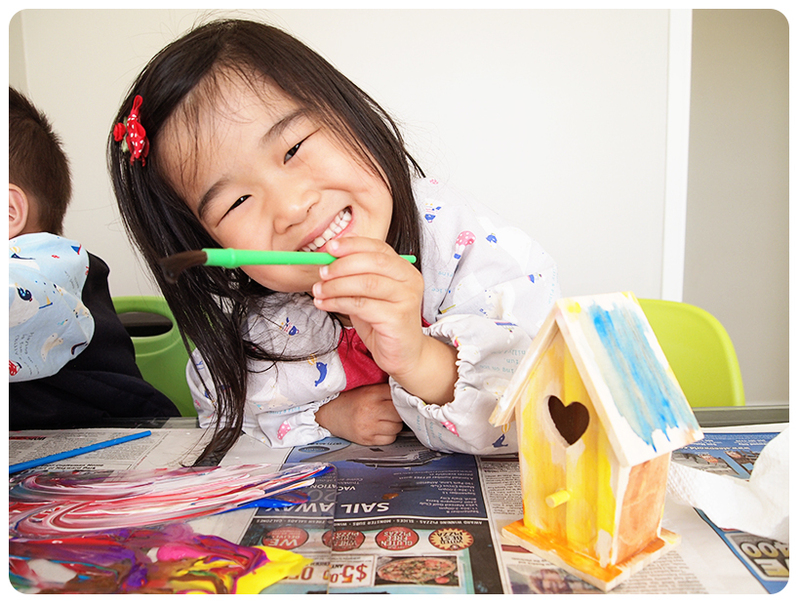 Froo was really happy to finally paint her birdhouse. I think the focused concentration lasted for almost 5 minutes. Woo hoo! It can be done.